Alan H. Daniels, MD is a Board-Certified spine surgeon who specializes in complex spinal disorders. He serves as the Chief of the Adult Spinal Deformity service at Rhode Island Hospital and The Miriam Hospital. He is also the Director of spine surgery research, an Associate Professor of orthopaedic surgery at The Warren Alpert Medical School of Brown University and co-director of the Brown Spine Surgery Fellowship. Dr. Daniels’ practice focuses on patients who suffer from scoliosis, kyphosis, flatback syndrome, failed spinal surgery, degenerative spinal disease, as well as spinal trauma and spinal tumors. Many of his patients have undergone one or more previous spinal surgeries, although he also performs primary spinal surgery. Dr. Daniels, a fellowship-trained spine surgeon, received his medical degree from the Oregon Health and Science University in Portland and completed his orthopedic surgery residency training at Brown University. His research focuses on spinal biomechanics, optimization of outcomes following spinal deformity surgery, complication prevention, and correction of complex spinal deformity. He has published more than 200 peer-reviewed articles, 225 national and international research posters/presentations, and has edited 4 orthopedic education textbooks. He is a member of the American Academy of Orthopedic Surgeons, the Lumbar Spine Research Society, and is a candidate member of the Scoliosis Research Society. M.D., Oregon Health and Science University in Portland, OR. Orthopaedic Surgery, Rhode Island Hospital. Kailey E. Lyford, PA-C is a physician assistant (PA) who specializes in spine disorders and works with Mark A. Palumbo, MD and Alan H. Daniels, MD. She spends her time both in the office seeing patients as well as assisting in the operating room alongside Dr. Palumbo and Dr. Daniels. Kailey grew up in southern Rhode Island and received her undergraduate degree in Allied Health Science at University of Connecticut in Storrs, Connecticut. She then completed her Master in Medical Science in Physician Assistant Studies in 2013 at Arcadia University in Christiana, Delaware. Kailey is a board-certified Physician Assistant (PA-C) through the National Commission on Certification of Physician Assistants (NCCPA). She is a member of the American Academy of Physician Assistants (AAPA) as well as a member of Pi Alpha, the National Honor Society for Physician Assistants. Kailey is also the Clinical Liaison between University Orthopedics and Bryant University’s Physician Assistant program, coordinating rotations for students at our practice and acting as one of their clinical preceptors. Prior to moving back to Rhode Island and joining University Orthopedics in 2015, Kailey practiced pediatric orthopedics at the Alfred I duPont Hospital for Children in Wilmington, Delaware. While she spent time working in general pediatric orthopedic care, she specialized in cerebral palsy and neuromuscular conditions. Krista Szatkowski is a physician assistant who specializes in spinal disorders, working with Mark Palumbo, MD and Alan Daniels, MD. Krista is involved in the many facets of care for our spine patients; seeing patients in the office as well as assisting both Dr. Palumbo and Dr. Daniels in the operating room. Krista grew up in Rhode Island and completed her undergraduate degree at the University of Rhode Island in Biological Sciences and went on to earn her Masters of Science degree at Seton Hill University in Greensburg, Pennsylvania. She is nationally certified by the National Commission for Certification of Physician Assistants (NCCPA) and is also a member of the American Academy of Physician Assistants (AAPA). Prior to joining University Orthopedics in 2016, Krista began her career in Neurosurgery focusing on spine disorders and pain management. 1. Ruddell JH, Eltorai AEM, DePasse JM, Kuris EO, Gil JA, Cho DK, Paxton ES, Green A, Daniels AH. Trends in the Orthopaedic Surgery Subspecialty Fellowship Match: Assessment of 2010 to 2017 Applicant and Program Data. J Bone Joint Surg Am. 2018 Nov 7;100(21):e139. doi: 10.2106/JBJS.18.00323. PubMed PMID: 30399086. 2. Martin TJ, Patel SA, Tran M, Eltorai AS, Daniels AH, Eltorai AEM. Patient Factors Associated with Successful Incentive Spirometry. R I Med J (2013). 2018 Nov 1;101(9):14-18. PubMed PMID: 30384513. 3. Passias PG, Poorman GW, Lafage V, Smith J, Ames C, Schwab F, Shaffrey C, Segreto FA, Horn SR, Bortz CA, Varlotta CG, Hockley A, Wang C, Daniels A, Neuman B, Hart R, Burton D, Javidan Y, Line B, LaFage R, Bess S, Sciubba D; ISSG.Cervical Versus Thoracolumbar Spinal Deformities: A Comparison of Baseline Quality-of-Life Burden. Clin Spine Surg. 2018 Oct 26. doi: 10.1097/BSD.0000000000000743. [Epub ahead of print] PubMed PMID: 30371600. 4. Deckey DG, Eltorai AEM, Gil JA, Daniels AH. Assessment of malpractice claims associated with rotator cuff surgery. Orthop Rev (Pavia). 2018 Sep 5;10(3):7703. doi: 10.4081/or.2018.7703. eCollection 2018 Sep 5. PubMed PMID: 30370037; PubMed Central PMCID: PMC6187002. 5. Shantharam G, DePasse JM, Eltorai AEM, Durand WM, Palumbo MA, Daniels AH. Physician and patients factors associated with outcome of spinal epidural abscess related malpractice litigation. Orthop Rev (Pavia). 2018 Sep 26;10(3):7693. doi: 10.4081/or.2018.7693. eCollection 2018 Sep 5. PubMed PMID: 30370036; PubMed Central PMCID: PMC6187001. 6. Gil JA, Durand W, Johnson JP, Goodman AD, Daniels AH. Effect of Obesity on Perioperative Complications, Hospital Costs, and Length of Stay in Patients with Open Ankle Fractures. J Am Orthop Surg. 2018 Oct 5. Doi: 10.5435/JAAOS-D-17-00860. 7. Babu JM, Patel SA, Palumbo MA, Daniels AH. Spinal Emergencies in Primary Care Practice. Am J Med. 2018 Oct 3. piiS0002-9343(18)30945-8. Doi:10.1016/j.amjmed.2018.09.22. 8. Ruttiman R, Eltorai AEM, Daniels AH. Etiology and Management of Spinal Deformity in Patients With Parkinson's Disease. Int J Spine Surg. 2018 Mar 30;12(1):15-21. doi: 10.14444/5003. eCollection 2018 Jan. PubMed PMID: 30280078; PubMed Central PMCID: PMC6162045. 9. Eltorai AEM, Eltorai AS, Fuentes C, Durand WM, Daniels AH, Ali S. Financial Implications of Physician Specialty Choice. R I Med J (2013). 2018 Oct 1;101(8):50-55. PubMed PMID: 30278604. 10. Reid DBC, Shah KN, Ruddell JH, Shapiro B, Akelman E, Robertson AP, Palumbo MA, Daniels AH. Effect of Narcotic Prescription Limiting Legislation on Opioid Utilization Following Lumbar Spine Surgery. Spine J. 2018 Sep 14. pii: S1529-9430(18)31134-3. doi: 10.1016/j.spinee.2018.09.007. [Epub ahead of print] PubMed PMID: 30223089. 11. Eltorai AEM, Baird GL, Pangborn J, Eltorai AS, Antoci V Jr, Paquette K, Connors K, Barbaria J, Smeals KJ, Riley B, Patel SA, Agarwal S, Healey TT, Ventetuolo CE, Sellke FW, Daniels AH. Financial Impact of Incentive Spirometry. Inquiry. 2018 Jan-Dec;55:46958018794993. doi: 10.1177/0046958018794993. PubMed PMID: 30175643. 12. Kalagara S, Eltorai AEM, DePasse JM, Daniels AH. Predictive Factors of Positive Online Patient Ratings of Spine Surgeons. Spine J. 2018 Aug 1. pii: S1529-9430(18)31083-0. doi: 10.1016/j.spinee.2018.07.024. [Epub ahead of print] PubMed PMID: 30077043. 13. Goodman AD, Johnson JP, Kleiner JE, Gil JA, Daniels AH. The expanding use of total elbow arthroplasty for distal humerus fractures: a retrospective database analysis of 56,379 inpatients from 2002-2014. Phys Sportsmed. 2018 Aug 9:1-7. doi: 10.1080/00913847.2018.1508315. [Epub ahead of print] PubMed PMID: 30073892. 14. Passias PG, Horn SR, Poorman GW, Daniels AH, Hamilton DK, Kim HJ, Diebo BG, Steinmetz L, Bortz CA, Segreto FA, Sciubba DM, Smith JS, Neuman BJ, Shaffrey CI, Lafage R, Lafage V, Ames C, Hart R, Mundis G, Eastlack RK, Schwab FJ; International Spine Study Group (ISSG). Clinical and radiographic presentation and treatment of patients with cervical deformity secondary to thoracolumbar proximal junctional kyphosis are distinct despite achieving similar outcomes: Analysis of 123 prospective CD cases. J Clin Neurosci. 2018 Jul 2. pii: S0967-5868(18)30583-6. doi: 10.1016/j.jocn.2018.06.040. [Epub ahead of print] PubMed PMID: 30042069. 15. Kosinski LR, Gil JA, Durand WM, DeFroda SF, Owens BD, Daniels AH. 30-Day readmission following outpatient rotator cuff repair: an analysis of 18,061 cases. Phys Sportsmed. 2018 Jul 27:1-5. doi: 10.1080/00913847.2018.1502571. [Epub ahead of print] PubMed PMID: 30021075. 16. DePasse JM, Durand W, Daniels AH. Predictors of Non-Neurologic Complications and Increased Length of Stay after Cervical Spine Osteotomy. World Neurosurg. 2018 Jul 12. pii: S1878-8750(18)31506-7. doi: 10.1016/j.wneu.2018.07.029. [Epub ahead of print] PubMed PMID: 30010068. 17. Durand WM, Eltorai AEM, Depasse JM, Yang J, Daniels AH. Risk Factors for Unplanned Reoperation Within 30 Days Following Elective Posterior Lumbar Spinal Fusion. Global Spine J. 2018 Jun;8(4):388-395. doi: 10.1177/2192568217736269. Epub 2017 Oct 25. PubMed PMID: 29977725; PubMed Central PMCID: PMC6022952. 18. Daniels AH, DePasse JM, Durand W, Hamilton DK, Passias P, Kim HJ, Protopsaltis T, Reid DBC, LaFage V, Smith JS, Shaffrey C, Gupta M, Klineberg E, Schwab F, Burton D, Bess S, Ames C, Hart RA; International Spine Study Group. Rod Fracture After Apparently Solid Radiographic Fusion in Adult Spinal Deformity Patients. World Neurosurg. 2018 Jun 19. pii: S1878-8750(18)31286-5. doi: 10.1016/j.wneu.2018.06.071. [Epub ahead of print] PubMed PMID: 29929025. 19. Ahmed SA, Shantharam G, Eltorai AEM, Hartnett DA, Goodman A, Daniels AH. The Effect of Psychosocial Measures of Resilience and Self-Efficacy in Patients with Neck and Lower Back Pain. Spine J. 2018 Jun 12. pii: S1529-9430(18)30285-7. doi: 10.1016/j.spinee.2018.06.007. [Epub ahead of print] PubMed PMID: 29906617. 20. DePasse JM, Durand W, Eltorai AEM, Palumbo MA, Daniels AH. Timing of complications following posterior cervical fusion. J Orthop. 2018 Mar 31;15(2):522-526. doi: 10.1016/j.jor.2018.03.010. eCollection 2018 Jun. PubMed PMID: 29881186; PubMed Central PMCID: PMC5990350. 21. Mulcahey MK, Waterman BR, Hart R, Daniels AH. The Role of Mentoring in the Development of Successful Orthopaedic Surgeons. J Am Acad Orthop Surg. 2018 May 28. doi: 10.5435/JAAOS-D-16-00665. [Epub ahead of print] PubMed PMID: 29847421. 22. Khalsa AS, Mundis GM Jr, Yagi M, Fessler RG, Bess S, Hosogane N, Park P, Than KD, Daniels A, Iorio J, Ledesma JB, Tran S, Eastlack RK; International Spine Study Group. Variability in Assessing Spinopelvic Parameters With Lumbosacral Transitional Vertebrae: Inter- and Intraobserver Reliability Among Spine Surgeons. Spine (Phila Pa 1976). 2018 Jun 15;43(12):813-816. doi: 10.1097/BRS.0000000000002433. PubMed PMID: 29846363. 23. Gil JA, Bokshan S, Genovese T, Got C, Daniels AH. Medical Malpractice Following Carpal Tunnel Surgery. Orthopedics. 2018 May 29:1-3. doi: 10.3928/01477447-20180524-05. [Epub ahead of print] PubMed PMID: 29813166. 24. Durand WM, Ruddell JH, Eltorai AEM, DePasse JM, Daniels AH. Ileus Following Adult Spinal Deformity Surgery. World Neurosurg. 2018 May 23. pii: S1878-8750(18)31052-0. doi: 10.1016/j.wneu.2018.05.099. [Epub ahead of print] PubMed PMID: 29803069. 25. Shah KN, Walker G, Koruprolu SC, Daniels AH. Biomechanical comparison between titanium and cobalt chromium rods used in a pedicle subtraction osteotomy model. Orthop Rev (Pavia). 2018 Mar 29;10(1):7541. doi: 10.4081/or.2018.7541. eCollection 2018 Mar 29. PubMed PMID: 29770179; PubMed Central PMCID: PMC5937366. 26. Gil JA, Durand WM, Johnson JP, Goodman AD, Owens BD, Daniels AH. Unanticipated Admission Following Outpatient Rotator Cuff Repair: An Analysis of 18,061 Cases. Orthopedics. 2018 May 8:1-5. doi: 10.3928/01477447-20180501-04. [Epub ahead of print] PubMed PMID: 29738599. 28. Ailon T, Hamilton DK, Klineberg E, Daniels AH, Lafage V, Bess S, Burton DC, Gupta M, Schwab F, Ames CP, Smith JS, Shaffrey CI, Hart RA; International Spine Study Group. Radiographic Fusion Grade Does Not Impact Health Related Quality of Life in the Absence of Instrumentation Failure for Patients Undergoing Posterior Instrumented Fusion for Adult Spinal Deformity. World Neurosurg. 2018 Apr 27. pii: S1878-8750(18)30847-7. doi: 10.1016/j.wneu.2018.04.127. [Epub ahead of print] PubMed PMID: 29709744. 29. Daniels AH, Bess S, Line B, Eltorai AEM, Reid DBC, Lafage V, Akbarnia BA, Ames CP, Boachie-Adjei O, Burton DC, Deviren V, Kim HJ, Hart RA, Kebaish KM, Klineberg EO, Gupta M, Mundis GM Jr., Hostin RA Jr., O'Brien M, Schwab FJ, Shaffrey CI, Smith JS; ISSG. Peak Timing for Complications Following Adult Spinal Deformity Surgery. World Neurosurg. 2018 Apr 21. pii: S1878-8750(18)30803-9. doi: 10.1016/j.wneu.2018.04.084. [Epub ahead of print] PubMed PMID: 29689393. 30. Durand WM, Peters JL, Eltorai AEM, Kalagara S, Osband AJ, Daniels AH. Medical Crowdfunding for Organ Transplantation. Clin Transplant. 2018 Apr 23:e13267. doi: 10.1111/ctr.13267. [Epub ahead of print] PubMed PMID: 29683220. 31. Durand WM, DePasse JM, Kuris EO, Yang J, Daniels AH. Late-presenting dural tear: incidence, risk factors, and associated complications. Spine J. 2018 Apr 18. pii: S1529-9430(18)30158-X. doi: 10.1016/j.spinee.2018.04.004. [Epub ahead of print] PubMed PMID: 29679726. 32. Shah KN, Eltorai AEM, Perera S, Durand WM, Shantharam G, Owens BD, Daniels AH. Medical Malpractice Litigation Following Arthroscopic Surgery. Arthroscopy. 2018 Apr 10. pii: S0749-8063(18)30186-5. doi: 10.1016/j.arthro.2018.02.035. [Epub ahead of print] PubMed PMID: 29653793. 33. Han A, Bokshan SL, Marcaccio SE, DePasse JM, Daniels AH. Diagnostic Criteria and Clinical Outcomes in Sarcopenia Research: A Literature Review. J Clin Med. 2018 Apr 8;7(4). pii: E70. doi: 10.3390/jcm7040070. Review. PubMed PMID:29642478; PubMed Central PMCID: PMC5920444. 34. Durand WM, Goodman AD, Johnson JP, Daniels AH.Assessment of 30-day mortality and complication rates associated with extended deep vein thrombosis prophylaxis following hip fracture surgery. Injury. 2018 Mar 19. pii: S0020-1383(18)30131-1. doi: 10.1016/j.injury.2018.03.019. [Epub ahead of print] PubMed PMID: 29580646. 35. Wang J, Eltorai AEM, DePasse JM, Durand W, Reid D, Daniels AH. Variability in Treatment for Patients with Cervical Spine Fracture and Dislocation: an Analysis of 107,152 Patients. World Neurosurg. 2018 Feb 28. pii: S1878-8750(18)30392-9. doi: 10.1016/j.wneu.2018.02.119. [Epub ahead of print] PubMed PMID: 29501518. 36. Eltorai AEM, Durand WM, Haglin JM, Rubin LE, Weiss AC, Daniels AH. Trends in Medicare Reimbursement for Orthopedic Procedures: 2000 to 2016. Orthopedics. 2018 Mar 1:1-8. doi: 10.3928/01477447-20180226-04. [Epub ahead of print] PubMed PMID: 29494748. 37. Passias PG, Horn SR, Bortz CA, Ramachandran S, Burton DC, Protopsaltis T, Lafage R, Lafage V, Diebo BG, Poorman GW, Segreto FA, Smith JS, Ames C, Shaffrey CI, Kim HJ, Neuman B, Daniels AH, Soroceanu A, Klineberg E; International Spine Study Group (ISSG). The Relationship between Improvements in Myelopathy and Sagittal Realignment in Cervical Deformity Surgery Outcomes. Spine (Phila Pa 1976). 2018 Feb 16. doi: 10.1097/BRS.0000000000002610. [Epub ahead of print] PubMed PMID: 29462071. 38. DePasse JM, Valdes M, Palumbo MA, Daniels AH, Eberson CP. S-1 alar/iliac screw technique for spinopelvic fixation. J Neurosurg Spine. 2018 Feb 2:1-5. doi: 10.3171/2017.8.SPINE16904. [Epub ahead of print] PubMed PMID: 29393830. 39. Eltorai AEM, Baird GL, Eltorai AS, Pangborn J, Antoci V Jr, Cullen HA, Paquette K, Connors K, Barbaria J, Smeals KJ, Agarwal S, Healey TT, Ventetuolo CE, Sellke FW, Daniels AH.Incentive Spirometry Adherence: A National Survey of Provider Perspectives. Respir Care. 2018 Jan 23. pii: respcare.05882. doi: 10.4187/respcare.05882. [Epub ahead of print] PubMed PMID: 29362219. 40. Eltorai AEM, Baird GL, Eltorai AS, Pangborn J, Antoci V Jr, Cullen HA, Paquette K, Connors K, Barbaria J, Smeals KJ, Agarwal S, Healey TT, Ventetuolo CE, Sellke FW, Daniels AH.Perspectives on Incentive Spirometry Utility and Patient Protocols. Respir Care. 2018 Jan 23. pii: respcare.05872. doi:10.4187/respcare.05872. [Epub ahead of print] PubMed PMID: 29362216. 41. Reid DBC, Daniels AH, Ailon T, Miller E, Sciubba DM, Smith JS, Shaffrey CI, Schwab F, Burton D, Hart RA, Hostin R, Line B, Bess S, Ames CP; International Spine Study Group. Frailty and Health-Related Quality of Life Improvement Following Adult Spinal Deformity Surgery. World Neurosurg. 2018 Jan 31. pii: S1878-8750(18)30122-0. doi: 10.1016/j.wneu.2018.01.079. [Epub ahead of print] PubMed PMID: 29360585. 42. Grabel ZJ, Hart RA, Clark AP, Park SH, Shaffrey CI, Scheer JK, Smith JS, Kelly MP, DePasse JM, Gupta MC, Ames CP, Daniels AH. Adult Spinal Deformity Knowledge in Orthopedic Spine Surgeons: Impact of Fellowship Training, Experience, and Practice Characteristics. Spine Deform. 2018 Jan;6(1):60-66. doi: 10.1016/j.jspd.2017.06.003. PubMed PMID: 29287819. 43. Ailon T, Smith JS, Shaffrey CI, Kim HJ, Mundis G, Gupta M, Klineberg E, Schwab F, Lafage V, Lafage R, Passias P, Protopsaltis T, Neuman B, Daniels A, Scheer JK, Soroceanu A, Hart R, Hostin R, Burton D, Deviren V, Albert TJ, Riew KD, Bess S, Ames CP; International Spine Study Group. Outcomes of Operative Treatment for Adult Cervical Deformity: A Prospective Multicenter Assessment With 1-Year Follow-up. Neurosurgery. 2017 Dec 21. doi: 10.1093/neuros/nyx574. [Epub ahead of print] PubMed PMID: 29281107. 44. Eltorai AEM, Szabo AL, Antoci V Jr, Ventetuolo CE, Elias JA, Daniels AH, Hess DR. Clinical Effectiveness of Incentive Spirometry for the Prevention of Postoperative Pulmonary Complications. Respir Care. 2017 Dec 26. pii: respcare.05679. doi: 10.4187/respcare.05679. [Epub ahead of print] Review. PubMed PMID: 29279365. 45. Passias PG, Bortz C, Horn S, Segreto F, Poorman G, Jalai C, Daniels A, Hamilton DK, Kim HJ, Sciubba D, Smith JS, Neuman B, Shaffrey C, Lafage V, Protopsaltis T, Ames C, Hart R, Mundis G, Eastlack R. Drivers of Cervical Deformity Have a Strong Influence on Achieving Optimal Radiographic and Clinical Outcomes at 1 year Following Cervical Deformity Surgery. World Neurosurg. 2017 Dec 14. pii: S1878-8750(17)32140-X. doi: 10.1016/j.wneu.2017.12.024. [Epub ahead of print] PubMed PMID: 29248781. 46. Rastegar F, Contag A, Daniels A, Hiratzka J, Lin C, Chang J, Than K, Raslan A, Kong C, Nguyen NL, Hostin R, Kane M, Hart RA. Proximal Junctional Kyphosis: Inter- and Intraobserver Reliability of Radiographic Measurements in Adult SpinalDeformity. Spine (Phila Pa 1976). 2018 Jan 1;43(1):E40-E44. doi: 10.1097/BRS.0000000000002261. PubMed PMID: 29232355. 47. Durand WM, DePasse JM, Daniels AH. Predictive Modeling for Blood Transfusion Following Adult Spinal Deformity Surgery: A Tree-Based Machine Learning Approach. Spine (Phila Pa 1976). 2017 Dec 5. doi: 10.1097/BRS.0000000000002515. [Epub ahead of print] PubMed PMID: 29215501. 48. Bokshan SL, Ruttiman R, Eltorai AEM, DePasse JM, Daniels AH, Owens BD. Factors Associated With Physician Loss in Anterior Cruciate Ligament Reconstruction Malpractice Lawsuits. Orthop J Sports Med. 2017 Nov 17;5(11):2325967117738957. doi: 10.1177/2325967117738957. eCollection 2017 Nov. PubMed PMID: 29201926; PubMed Central PMCID: PMC5697590. 49. Durand WM, Eltorai AEM, Shantharam G, DePasse JM, Kuris EO, Hersey AE, Palumbo MA, Daniels AH. Medical Malpractice Claims Following Incidental Durotomy Due toSpinal Surgery. Spine (Phila Pa 1976). 2017 Dec 4. doi:10.1097/BRS.0000000000002469. [Epub ahead of print] PubMed PMID: 29200173. 50. Poorman GW, Passias PG, Horn SR, Frangella NJ, Daniels AH, Hamilton DK, Kim H, Sciubba D, Diebo BG, Bortz CA, Segreto FA, Kelly MP, Smith JS, Neuman BJ, Shaffrey CI, LaFage V, LaFage R, Ames CP, Hart R, Mundis GM Jr, Eastlack R; International Spine Study Group. Despite worse baseline status depressed patients achieved outcomes similar to those in nondepressed patients after surgery for cervical deformity. Neurosurg Focus. 2017 Dec;43(6):E10. doi: 10.3171/2017.8.FOCUS17486. PubMed PMID: 29191101. 51. Miller EK, Neuman BJ, Jain A, Daniels AH, Ailon T, Sciubba DM, Kebaish KM, Lafage V, Scheer JK, Smith JS, Bess S, Shaffrey CI, Ames CP; International Spine Study Group. An assessment of frailty as a tool for risk stratification in adult spinal deformity surgery. Neurosurg Focus. 2017 Dec;43(6):E3. doi: 10.3171/2017.10.FOCUS17472. PubMed PMID: 29191099. 52. Hart RA, Rastegar F, Contag A, Kane M, Daniels A, Klineberg E, Eastlack R, Smith JS, Hostin R, Hamilton DK, Gum JL, Burton DC, Sheer JK, Ames C, Schwab F, Lafage V, Bess S, Shaffrey C, Kebaish K; and the International Spine Study Group. Inter- and Intra-rater Reliability of the Hart-ISSG Proximal Junctional Failure Severity Scale. Spine (Phila Pa 1976). 2017 Nov 20. doi: 10.1097/BRS.0000000000002498. [Epub ahead of print] PubMed PMID: 29189643. 53. Ramchandran S, Protopsaltis TS, Sciubba D, Scheer JK, Jalai CM, Daniels A, Passias PG, Lafage V, Kim HJ, Mundis G, Klineberg E, Hart RA, Smith JS, Shaffrey C, Ames CP; International Spine Study Group. Prospective multi-centric evaluation of upper cervical and infra-cervical sagittal compensatory alignment in patients with adult cervical deformity. European Spine Journal. 2017 Nov 28. doi: 10.1007/s00586-017-5395-x. [Epub ahead of print] PubMed PMID: 29185112. 54. Durand WM, Johnson JR, Eltorai AEM, Daniels AH. Medical Crowdfunding for Patients Undergoing Orthopedic Surgery. Orthopedics. 2017 Nov 20:1-6. doi: 10.3928/01477447-20171114-04. [Epub ahead of print] PubMed PMID: 29156070. 55. Sobel AD, Reid DB, Blood TD, Daniels AH, Cruz AI Jr. Pediatric Orthopedic Hoverboard Injuries: A Prospectively Enrolled Cohort. Journal of Pediatrics. 2017 Nov;190:271-274. doi: 10.1016/j.jpeds.2017.07.041. PubMed PMID: 29144253. 56. DePasse JM, Daniels AH, Durand W, Kingrey B, Prodromo J, Mulcahey MK. Completion of Multiple Fellowships by Orthopedic Surgeons: Analysis of the American Board of Orthopaedic Surgery Certification Database. Orthopedics. 2017 Nov 11:1-5. doi: 10.3928/01477447-20171106-05. [Epub ahead of print] PubMed PMID 29136254. 57. Khalsa AS, Mundis GM Jr, Yagi M, Fessler R, Bess S, Hosogane N, Park P, Than K, Daniels AH, Iorio J, Ledesma J, Tran S, Eastlack RK. Variability in Assessing Spinopelvic Parameters with Lumbosacral Transitional Vertebrae: Inter- and Intra-observer Reliability among Spine Surgeons. Spine (Phila Pa 1976). 2017 Oct 3. doi: 10.1097/BRS.0000000000002433. [Epub ahead of print] PubMed PMID: 28984735. 58. Bokshan SL, Han A, DePasse JM, Marcaccio SE, Eltorai AEM, Daniels AH. Inpatient costs and blood transfusion rates of sarcopenic patients following thoracolumbar spine surgery. Journal of Neurosurgery: Spine. 2017 Oct 6:1-5. doi: 10.3171/2017.5.SPINE17171. [Epub ahead of print] PubMed PMID: 28984514. 59. Daniels AH, Kuris EO, Kleinhenz DT, Palumbo MA. Spine Surgery Outcomes in Workers' Compensation Patients. Journal of the American Academy of Orthopedic Surgeons. 2017 Oct;25(10):e225-e234. doi: 10.5435/JAAOS-D-16-00895. PubMed PMID: 28953088. 60. Durand WM, Johnson JR, Li NY, Yang J, Eltorai AEM, DePasse JM, Daniels AH. Hospital competitive intensity and perioperative outcomes following lumbar spinal fusion. The Spine Journal. 2017 Sep 4. pii: S1529-9430(17)30973-7. doi:10.1016/j.spinee.2017.08.256. [Epub ahead of print] PubMed PMID: 28882522. 61. Kleinhenz DT, Eltorai AEM, Huo S, Daniels AH. Traumatic cervical epidural hematoma due to fusion mass fracture following elective rod removal. Journal of Orthopedics. 2017 Aug 5;14(4):548-549. doi: 10.1016/j.jor.2017.07.014. eCollection 2017 Dec. PubMed PMID: 28878514; PubMed Central PMCID: PMC5574815. 62. DePasse JM, Park S, Eltorai AEM, Daniels AH. Factors predicting publication of spinal cord injury trials registered on www.ClinicalTrials. gov. Journal of Back MusculoskeletalRehabilitation. 2017 Aug 11. doi: 10.3233/BMR-169628. [Epub ahead of print] PubMed PMID: 28826165. 63. Haglin JM, Jain S, Eltorai AEM, Daniels AH. Bone Growth Stimulation: A Critical Analysis Review. JBJS Rev. 2017 Aug 15. doi: 10.2106/JBJS.RVW.16.00117. [Epub ahead of print] PubMed PMID: 28806266. 64. Bokshan SL, Ruttiman RJ, DePasse JM, Rubin LE, Palumbo MA, Daniels AH. Reported Litigation Associated With Primary Hip and Knee Arthroplasty. J Arthroplasty. 2017 Jul 11. pii: S0883-5403(17)30584-3. doi: 10.1016/j.arth.2017.07.001. [Epub ahead of print] PubMed PMID: 28781019. 65. Hamilton DK, Buza JA 3rd, Passias P, Jalai C, Kim HJ, Ailon T, Gupta M, Sciubba D, Jain A, Ames CP, Deviren V, Daniels A, Lafage V, Bess S, Klineberg E, Shaffrey CI, Smith JS, Hart R; Study Group. The Fate of Adult Spinal Deformity (ASD) Patients Incurring Rod Fracture After Thoracolumbar Fusion. World Neurosurg. 2017 Jul 19. pii: S1878-8750(17)31161-0. doi: 10.1016/j.wneu.2017.07.061. [Epub ahead of print] PubMed PMID: 28735127. 66. Daniels AH, Ruttiman R, Eltorai AEM, DePasse JM, Brea BA, Palumbo MA. Malpractice litigation following spine surgery. Journal of Neurosurgery: Spine. 2017 Jul 21:1-6. doi: 10.3171/2016.11.SPINE16646. [Epub ahead of print] PubMed PMID: 28731391. 67. DePasse JM, Haglin J, Eltorai AEM, Mulcahey MK, Eberson CP, Daniels AH. Orthopedic In-Training Examination Question Metrics and Resident Test Performance. Orthop Rev (Pavia). 2017 Jun 23;9(2):7006. doi: 10.4081/or.2017.7006. eCollection 2017 Jun 23. PubMed PMID: 28713525; PubMed Central PMCID: PMC5505093. 68. Rastegar F, Contag A, Daniels AH, Hiratzka J, Lin C, Chang J, Than K, Raslan A, Kong C, Nguyen NL, Hostin R, Kane M, Hart R. Proximal Junctional Kyphosis: Inter-and Intra-observer Reliability of Radiographic Measurements in Adult Spinal Deformity. Spine (Phila Pa 1976). 2017 Jun 6. doi: 10.1097/BRS.0000000000002261. [Epub ahead of print] PubMed PMID: 28591078. 69. Hernandez D, Garimella R, Eltorai AEM, Daniels AH. Computer-assisted Orthopaedic Surgery. Orthopaedic Surgery. 2017 Jun 7. doi: 10.1111/os.12323. [Epub ahead of print] Review. PubMed PMID: 28589561. 70. Neuman BJ, Ailon T, Scheer JK, Klineberg E, Sciubba DM, Jain A, Zebala LP, Passias PG, Daniels AH, Burton DC, Protopsaltis TS, Hamilton DK, Ames CP. Development and Validation of a Novel Adult Spinal Deformity Surgical Invasiveness Score: Analysis of 464 Patients. Neurosurgery. 2017 Jun 6. doi: 10.1093/neuros/nyx303. [Epub ahead of print] PubMed PMID: 28586476. 71. DePasse JM, Ruttiman R, Eltorai AEM, Palumbo MA, Daniels AH. Assessment of malpractice claims due to spinal epidural abscess. Journal of Neurosurgery: Spine. 2017 May 12:1-8. doi: 10.3171/2016.12.SPINE16814. [Epub ahead of print] PubMed PMID: 28498071. 72. DePasse JM, Sargent R, Fantry AJ, Bokshan SL, Palumbo MA, Daniels AH. Assessment of Malpractice Claims Associated With Acute Compartment Syndrome. Journal of the American Academy of Orthopedic Surgeons. 2017 Jun;25(6):e109-e113. doi: 10.5435/JAAOS-D-16-00460. PubMed PMID: 28489715. 73. Daniels AH, Hart RA, Hilibrand AS, Fish DE, Wang JC, Lord EL, Buser Z, Tortolani PJ, Stroh DA, Nassr A, Currier BL, Sebastian AS, Arnold PM, Fehlings MG, Mroz TE, Riew KD. Iatrogenic Spinal Cord Injury Resulting From Cervical Spine Surgery. Global Spine Journal. 2017 Apr;7(1 Suppl):84S-90S. doi: 10.1177/2192568216688188. Epub 2017 Apr 1. PubMed PMID: 28451499; PubMed Central PMCID: PMC5400194. 74. Smith JS, Line B, Bess S, Shaffrey CI, Kim HJ, Mundis G, Scheer JK, Klineberg E, O'Brien M, Hostin R, Gupta M, Daniels AH, Kelly M, Gum JL, Schwab FJ, Lafage V, Lafage R, Ailon T, Passias P, Protopsaltis T, Albert TJ, Riew KD, Hart R, Burton D, Deviren V, Ames CP, Group IS. The Health Impact of Adult Cervical Deformity in Patients Presenting for Surgical Treatment: Comparison to United States Population Norms and Chronic Disease States Based on the EuroQuol-5 Dimensions Questionnaire. Neurosurgery. 2017 Mar 24. doi: 10.1093/neuros/nyx028. [Epub ahead of print] PubMed PMID: 28368524. 75. Scheer JK, Smith JS, Schwab F, Lafage V, Shaffrey CI, Bess S, Daniels AH, Hart RA, Protopsaltis TS, Mundis GM Jr, Sciubba DM, Ailon T, Burton DC, Klineberg E, Ames CP; International Spine Study Group.. Development of a preoperative predictive model for major complications following adult spinal deformity surgery. Journal of Neurosurgery: Spine. 2017 Mar 24:1-8. doi: 10.3171/2016.10.SPINE16197. [Epub ahead of print] PubMed PMID: 28338449. 76. Daniels AH, KurisEO, Palumbo MA. The Role of the Orthopaedic Surgeon in Workers’ Compensation Cases. Journal of the American Academy of Orthopaedic Surgeons. 2017 Mar;25(3):e45-e52. doi: 10.5435/JAAOS-D-16-00499. PubMed PMID: 28199293. 77. Blood TD, Gil JA, Born CT, Daniels AH. Variability in Trauma Case Volume in Orthopedic Surgery Residents. Orthopedic Reviews (Pavia). 2017 Feb 20;9(1):6967. doi: 10.4081/or.2017.6967. PubMed PMID: 28286621; PubMed Central PMCID: PMC5337775. 78. Eltorai AE, Sobel AD, Thomas NP Jr, Daniels AH, Born CT. Update on Distal Radius Fractures. Orthopedics. 2017 Jan 20:1-8. doi: 10.3928/01477447-20170117-08. [Epub ahead of print] PubMed PMID: 28112784. 79. DeFroda SF, Gil JA, Blankenhorn BD, Daniels AH. Variability in Foot and Ankle Case Volume in Orthopaedic Residency Training. Foot and Ankle Specialist. 2017 Jan 1:1938640016687371. doi: 10.1177/1938640016687371. [Epub ahead of print] PubMed PMID: 28092978. 80. Haglin JM, Eltorai AE, Gil JA, Marcaccio SE, Botero-Hincapie J, Daniels AH. Patient-Specific Orthopaedic Implants. Orthopedic Surgery. 2016 Nov;8(4):417-424. doi: 10.1111/os.12282. Review. PubMed PMID: 28032697. 81. Waryasz GR, Suric V, Daniels AH, Gil JA, Eberson CP. CrossFit(®) Instructor Demographics and Practice Trends. Orthopedic Reviews (Pavia). 2016 Nov 17;8(4):6571. PubMed PMID: 27994826; PubMed Central PMCID: PMC5136753. 82. DePasse JM, Palumbo MA, Ahmed AK, Adams CA Jr, Daniels AH. Halo-Vest Immobilization in Elderly Odontoid Fracture Patients: Evolution in Treatment Modality and In-Hospital Outcomes. Clinical Spine Surgery. 2016 Nov 30. [Epub ahead of print] PubMed PMID: 27906741. 83. Eltorai AE, Susai CJ, Daniels AH. Mesenchymal stromal cells in spinal fusion: Current and future applications. Journal of Orthopedics. 2016 Oct 25;14(1):1-3. Review. PubMed PMID: 27821993; PubMed Central PMCID: PMC5090226. 84. Waryasz GR, Daniels AH, Gil JA, Suric V, Eberson CP. NCAA strength and conditioning coach demographics, current practice trends and common injuries of athletes during strength and conditioning sessions. Journal of Sports Medicine and PhysicalFitness. 2016 Oct;56(10):1188-1197. PubMed PMID: 26473446. 85. Waryasz GR, Daniels AH, Gil JA, Suric V, Eberson CP. Personal Trainer Demographics, Current Practice Trends and Common Trainee Injuries. Orthopedic Reviews (Pavia). 2016 Oct 3;8(3):6600. PubMed PMID: 27761219. 86. Cohen BH, Gaspar MP, Daniels AH, Akelman E, Kane PM. Multifocal Neuropathy: Expanding the Scope of Double Crush Syndrome. Journal of Hand Surgery American. 2016 Oct 14. pii: S0363-5023(16)30648-7. doi: 10.1016/j.jhsa.2016.09.009. [Epub ahead of print] Review. PubMed PMID: 27751780. 87. Hamilton DK, Kong C, Hiratzka J, Contag AG, Ailon T, Line B, Daniels A, Smith JS, Passias P, Protopsaltis T, Sciubba D, Burton D, Shaffrey C, Klineberg E, Mundis G, Kim HJ, Lafage V, Lafage R, Scheer J, Boachie-Adjei O, Bess S, Hart R. Patient Satisfaction after Adult Spinal Deformity Surgery Does Not Strongly Correlate with Health-Related Quality of Life Scores, Radiographic Parameters or Occurrence of Complications. Spine (Phila Pa 1976). 2016 Sep 29. [Epub ahead of print] PubMed PMID: 27748701. 88. Gil JA, DeFroda SF, Sindhu K, Cruz AI Jr, Daniels AH. Challenges of Fracture Management for Adults WithOsteogenesis Imperfecta. Orthopedics. 2016 Oct 13:1-6. doi: 10.3928/01477447-20161006-04. [Epub ahead of print] PubMed PMID: 27735980. 89. Daniels AH, Koller H, Hiratzka SL, Mayer M, Meier O, Contag AG, Eltorai AE, Hiratzka J, Kojo Hamilton D, Shaffrey CI, Smith JS, Bess S, Klineberg EO, Ames CP, Lafage V, Line B, Schwab FJ, Hart RA, Group IS. Selecting caudal fusion levels: 2 year functional and stiffness outcomes with matched pairs analysis in multilevel fusion to L5 versus S1. European Spine Journal 2016 Sep 27. [Epub ahead of print] PubMed PMID: 27679430. 90. Jain S, Eltorai AE, Ruttiman R, Daniels AH. Advances in Spinal Interbody Cages. Orthopaedic Surgery. 2016 Aug;8(3):278-84. doi: 10.1111/os.12264. Review. PubMed PMID: 27627709. 91. Bokshan SL, Han AL, DePasse JM, Eltorai AE, Marcaccio SE, Palumbo MA, Daniels AH. Effect of Sarcopenia on Postoperative Morbidity and Mortality After Thoracolumbar Spine Surgery. Orthopedics. 2016 Aug 18:1-6. doi: 10.3928/01477447-20160811-02. [Epub ahead of print] PubMed PMID: 27536954. 92. Hodax JD, DePasse JM, Daniels AH, Palumbo MA. Delayed diagnosis of a thoracolumbar flexion-distraction injury. Journal of Emergencies Trauma Shock. 2016 Jul-Sep;9(3):125-7. doi: 10.4103/0974-2700.185273. PubMed PMID: 27512335; PubMed Central PMCID: PMC4960780. 93. Daniels AH, DePasse JM, Eltorai AE, Palumbo MA. Perpendicular Iliac Screw Placement for Reinforcement of Spinopelvic Stabilization. Orthopedics. 2016 Aug 1:1-4. doi: 10.3928/01477447-20160729-02. [Epub ahead of print] PubMed PMID: 27482727. 94. Johnson JP, Daniels AH, Grabel ZJ, Miller SM, Eberson CP. Referral for Adolescent Idiopathic Scoliosis by Pediatric Primary Care Providers. Clinical Pediatrics (Phila). 2016 Jul 12. pii: 0009922816657150. [Epub ahead of print] PubMed PMID: 27412803. 95. Hart RA, DePasse JM, Daniels AH. Failure to Launch: What the Rejection of Lumbar Total Disk Replacement Tells us About American Spine Surgery. Clinical Spine Surgery. 2016 Jul 11. [Epub ahead of print] PubMed PMID: 27404851. 96. DeFroda SF, Daniels AH, Deren ME. Differentiating Radiculopathy from Lower Extremity Arthropathy. American Journal of Medicine. 2016 Jul 8. pii: S0002-9343(16)30676-3. doi: 10.1016/j.amjmed.2016.06.019. [Epub ahead of print] Review. PubMed PMID: 27401953. 97. Pidgeon T, Daniels AH, Kane PM, Vopat BG, Born CT. The History of Femoral Intramedullary Nailing. Temple University Journal of Orthopaedic Surgery and Sports Medicine 2016;11:122-132. 98. Waryasz GR, Liu D, Daniels AH. Influence of Medical Student Debt on the Decision to Pursue Careers in Primary Care. RI Medical Journal (2013). 2016 Jul 1;99(7):19-21. PubMed PMID: 27379353. 99. Eltorai AE, Cheatham M, Naqvi SS, Marthi S, Dang V, Palumbo MA, Daniels AH. Is the Readability of Spine-Related Patient Education Material Improving? : An Assessment of Subspecialty Websites. Spine (Phila Pa 1976). 2016 Jun;41(12):1041-8. doi: 10.1097/BRS.0000000000001446. PubMed PMID: 27294810. 100. Eltorai AEM, Haglin J, Perera S, Brea BA, Ruttiman R, Garcia DR, Born CT, Daniels AH. Antimicrobial technology in orthopedic and spinal implants. World Journal of Orthopedics. 2016 Jun 18;7(6):361-9. doi: 10.5312/wjo.v7.i6.361. eCollection 2016 Jun 18. Review. PubMed PMID: 27335811; PubMed Central PMCID: PMC4911519. 101. Eltorai AE, Thomas N, Yang H, Daniels AH, Born CT. Readability of trauma-related patient education materials from the American Academy of Orthopaedic Surgeons. Trauma Monthly 2016 Feb 6;21(1):e20141. doi: 10.5812/traumamon.20141. eCollection 2016 Feb. Review. PubMed PMID: 27218045; PubMed Central PMCID: PMC4869433. 102. Gil JA, Daniels AH, Akelman E. Resident Exposure to Peripheral Nerve Surgical Procedures During Residency Training. Journal of Graduate Medical Education. 2016 May;8(2):173-9. doi: 10.4300/JGME-D-15-00318.1. PubMed PMID: 27168883; PubMed Central PMCID: PMC4857513. 103. Bokshan SL, DePasse JM, Eltorai AE, Paxton ES, Green A, Daniels AH. An Evidence-Based Approach to Differentiating the Etiology of Shoulder and Cervical Spine Pain. American Journal of Medicine. 2016 May 4. pii: S0002-9343(16)30462-4. doi: 10.1016/j.amjmed.2016.04.023. [Epub ahead of print] Review. PubMed PMID: 27155111. 104. DePasse JM, Palumbo MA, Eberson CP, Daniels AH. Academic Characteristics of Orthopaedic Surgery Residency Applicants from 2007 to 2014. Journal of Bone and Joint Surgery. 2016 May 4;98(9):788-95. doi: 10.2106/JBJS.15.00222. PubMed PMID: 27147692. 105. McDonnell M, Shah KN, Paller DJ, Thakur NA, Koruprolu S, Palumbo MA, Daniels AH. Biomechanical Analysis of Pedicle Screw Fixation for Thoracolumbar Burst Fractures. Orthopedics. 2016 May 2:1-5. doi: 10.3928/01477447-20160427-09. [Epub ahead of print] PubMed PMID: 27135451. 106. Zhang S, Shultz P, Daniels A, Ackelman E, Kamal RN. High Disparity Between Orthopedic Resident Interest and Participation in International Health Electives. Orthopedics. 2016 Apr 25:1-7. doi: 10.3928/01477447-20160419-02. [Epub ahead of print] PubMed PMID: 27111074. 107. Daniels AH, Kawaguchi S, Contag AG, Rastegar F, Waagmeester G, Anderson PA, Arthur M, Hart RA. Hospital Charges Associated with "Never Events": Comparison of Anterior Cervical Discectomy and Fusion, Posterior Lumbar Interbody Fusion, and Lumbar Laminectomy to Total Joint Arthroplasty. Journal; of Neurosurgery: Spine. 2016 Aug;25(2):165-9. doi: 10.3171/2015.11.SPINE15776. Epub 2016 Mar 18. PubMed PMID: 26989978. 108. Johnson J, Cassidy DB, Tofte J, Bariteau J, Daniels AH. Orthopaedic Surgery Resident Debt Load and its Effect on Career Choice. Orthopedics. 2016 Mar 17:1-6. doi: 10.3928/01477447-20160315-01. [Epub ahead of print] PubMed PMID: 27018605. 109. Gil JA, Waryasz GR, Owens BD, Daniels AH. Variability of Arthroscopy Case Volume in Orthopaedic Surgery Residency. Arthroscopy. 2016 Mar 15. pii: S0749-8063(16)00048-7. doi: 10.1016/j.arthro.2016.01.018. [Epub ahead of print] PubMed PMID: 26993670. 110. Daniels AH, Gundle KR, Hart RA. Collateral Adverse Outcomes following Lumbar Spine Surgery. Instructional Course Lecture 65 2016;65:291-300. PubMed PMID: 27049197. 111. Smith JS, Klineberg E, Shaffrey CI, Lafage V, Schwab FJ, Protopsaltis T, Scheer JK, Ailon T, Ramachandran S, Daniels AH, Mundis G, Gupta M, Hostin R, Deviren V, Eastlack R, Passias P, Hamilton DK, Hart R, Burton DC, Bess S, Ames CP; International Spine Study Group. Assessment of Surgical Treatment Strategies for Moderate to Severe Cervical Spinal Deformity Reveals Marked Variation in Approaches, Osteotomies and Fusion Levels. World Neurosurgery. 2016 Apr 13. pii: S1878-8750(16)30093-6. doi: 10.1016/j.wneu.2016.04.020. [Epub ahead of print] PubMed PMID: 27086260. 112. Bokshan SL, DePasse JM, Daniels AH. Sarcopenia in Orthopaedic Surgery. Orthopedics. 2016 Feb 24:1-6. doi: 10.3928/01477447-20160222-02. [Epub ahead of print] PubMed PMID: 26913764. 113. Daniels AH, DePasse JM, Kamal RN. Orthopaedic Surgeon Burnout: Diagnosis, Treatment, and Prevention. Journal of the American Association of Orthopaedic Surgeons. 2016 Feb 15. [Epub ahead of print] PubMed PMID: 26885712. 114. Gil JA, Daniels AH, Weiss AP. Variability in Surgical Case Volume of Orthopaedic Surgery Residents: 2007 to 2013. Journal of the American Academy of Orthopaedic Surgeons. 2016 Mar;24(3):207-12. doi: 10.5435/JAAOS-D-15-00461. PubMed PMID: 26855117. 115. Daniels AH, Smith JS, Hiratzka J, Ames CP, Bess S, Shaffrey CI, Schwab FJ, Lafage V, Klineberg EO, Burton D, Mundis GM, Line B, Hart RA, ISSG. Functional limitations due to lumbar stiffness in adults with and without spinal deformity. Spine. (Phila Pa 1976). 2015 Oct 15;40(20):1599-604. doi: 10.1097/BRS.0000000000001090. PubMed PMID: 26731705. 116. Ha AY, DePasse JM, Piskorski A, Treaba DO, Kojic EM, Daniels AH. Compressive spinal epidural mass due to Propionibacterium acnes. The Spine Journal. 2015 Dec 22. pii: S1529-9430(15)01816-1. doi: 10.1016/j.spinee.2015.12.019. [Epub ahead of print] PubMed PMID: 26721733. 117. Eltorai AE, Naqvi SS, Ghanian S, Eberson CP, Weiss AC, Born CT, Daniels AH. Readability of Invasive Procedure Consent Forms. Clinical and Translational Science. 2015 Dec 17. doi: 10.1111/cts.12364. [Epub ahead of print] PubMed PMID: 26678039. 118. Eltorai AE, Kuris EO, Daniels AH. Psoas haematoma mimicking lumbar radiculopathy. Postgraduate Medical Journal. 2015 Dec 15. pii: postgradmedj-2015-133815. doi: 10.1136/postgradmedj-2015-133815. [Epub ahead of print] PubMed PMID: 26669607. 119. Eltorai AEM, Kuris E, Lucas PR, Daniels AH. Idiopathic ligamentum flavum hematoma. The Spine Journal. 2015 Nov 26. pii: S1529-9430(15)01685-X. doi: 10.1016/j.spinee.2015.11.024. [Epub ahead of print] PubMed PMID: 26631760. 120. Gil JA, Waryasz, Klyce W, Daniels AH. Heterotopic Ossification in Neurorehabilitation. Rhode Island Medical Journal 2015 Dec 1;98(12):32-4. PubMed PMID: 26623453. 121. Eltorai AEM, Nguyen E, Daniels AH. Three-Dimensional Printing in Orthopedic Surgery. Orthopedics. 2015 Nov 1;38(11):684-7. doi: 10.3928/01477447-20151016-05. PubMed PMID: 26558661. 122. Ramchandran S, Smith JS, Ailon T, Klineberg E, Shaffrey C, Lafage V, Schwab F, Bess S, Daniels AH, Scheer JK, Protopsaltis TS, Arnold P, Haid RW Jr, Chapman J, Fehlings MG, Ames CP; AOSpine North America, International Spine Study Group. Assessment of Impact of Long-Cassette Standing X-Rays on Surgical Planning for Cervical Pathology: An International Survey of Spine Surgeons. Neurosurgery. 2015 Nov 23. [Epub ahead of print] PubMed PMID: 26619335. 123. Shah KN, Waryasz G, DePasse JM, Daniels AH. Prevention of Paralytic Ileus Utilizing Alvimopan Following Spine Surgery. Orthopedic Reviews (Pavia). 2015 Sep 28;7(3):6087. eCollection 2015 Sep 28. PubMed PMID: 26605031; PubMed Central PMCID: PMC4592934. 124. Albright TH, Grabel Z, DePasse JM, Palumbo MA, Daniels AH. Sexual and reproductive function in spinal cord injury and spinal surgery patients. Orthopedic Reviews (Pavia) 2015 Sep 28;7(3):5842. eCollection 2015 Sep 28. Review. PubMed PMID: 26605025; PubMed Central PMCID: PMC4592928. 125. DeFroda SF, DePasse JM, Eltorai AE, Daniels AH, Palumbo MA. Evaluation and management of spinal epidural abscess. Journal of Hospital Medicine. 2015 Nov 5. doi: 10.1002/jhm.2506. [Epub ahead of print] Review. PubMed PMID: 26540492. 126. Kane PM, Daniels AH, Akelman EA. Double Crush Syndrome. Journal of the American Academy of Orthopaedic Surgeons 2015 Sep;23(9):558-62. doi: 10.5435/JAAOS-D-14-00176. Review. PubMed PMID: 26306807. 127. Truntzer J, Nacca C, Paller D, Daniels AH. Redefining the Economics of Geriatric Orthopedics. Geriatric Orthopaeics and Surgical Rehabilitation. 2014 Dec;5(4):200-6. doi: 10.1177/2151458514543002. PubMed PMID: 26246943; PubMed Central PMCID: PMC4252154. 128. Gil JA, Park S, Daniels AH. Variability in United States Allopathic Medical School Tuition. American Journal of Medicine. 2015 Aug 1. pii: S0002-9343(15)00700-7. doi: 10.1016/j.amjmed.2015.07.022. [Epub ahead of print] PubMed PMID: 26241346. 129. Daniels AH. Penetrating injury from high-speed motor vehicle collision. Journal of Emergencies, Trauma, and Shock. 2015 Jul-Sep;8(3):169. doi: 10.4103/0974-2700.160735. PubMed PMID: 26229302; PubMed Central PMCID: PMC4520032. 130. Daniels AH, DePasse JM, Eberson CP, Lucas PR, Palumbo MA. Adult Spinal Deformity: Contemporary Treatment and Patient Outcomes. RI Medical Journal (2013). 2015 Jul 1;98(7):32-41. PubMed PMID: 26125478. 131. Vigneswaran HT, Grabel ZJ, Eberson CP, Palumbo MA, Daniels AH. Surgical treatment of adolescent idiopathic scoliosis in the United States from 1997 to 2012: an analysis of 20, 346 patients. Journal of Neurosurgery: Pediatrics. 2015 Jun 26:1-7. [Epub ahead of print] PubMed PMID: 26114991. 132. Daniels AH, Ritterman SA, Rubin LE. Paralytic Ileus in the Orthopaedic Patient. Journal of the American Academy of Orthopaedic Surgeons. 2015 Jun;23(6):365-372. Epub 2015 Apr 26. PubMed PMID: 25917235. 133. Vopat BG, Daniels AH, Lareau CR, Christino MA, Kane PM, Hayda RA, Born CT. Hybrid Anterolateral Approach for Open Reduction and Internal Fixation of Femoral Neck Fractures. Orthopedics. 2015 Jul 1;38(7):430-4. doi: 10.3928/01477447-20150701-03. PubMed PMID: 26186310. 134. DePasse JM, Palumbo MA, Haque M, Eberson CP, Daniels AH. Complications associated with prone positioning in elective spinal surgery. World Journal of Orthopedics. 2015 Apr 18;6(3):351-9. doi: 10.5312/wjo.v6.i3.351. eCollection 2015 Apr 18. Review. PubMed PMID: 25893178. 135. Fantry AR, Elia G, Vopat BG, Daniels AH. Distal femoral complications following antegrade intramedullary nail placement. Orthopaedic Reviews (Pavia) 2015 Mar 24;7(1):5820. doi: 0.4081/or.2015.5820. eCollection 2015 Mar 3. PubMed PMID: 25874066. 136. Palumbo MA, Shah KN, Eberson CP, Hart RA, Daniels AH. Outrigger rod technique for supplemental support of posterior spinal arthrodesis. The Spine Journal 2015 2015 Jun 1;15(6):1409-14. doi: 10.1016/j.spinee.2015.03.004. Epub 2015 Mar 12. PubMed PMID: 25771756. 137. Lareau CR, Daniels AH, Vopat BG, Kane PM. Emergency department external fixation for provisional treatment of pilon and unstable ankle fractures. Journal of Emergencies, Trauma, and Shock. 2015 Jan-Mar;8(1):61-4. doi: 10.4103/0974-2700.150400. PubMed PMID: 25709258; PubMed Central PMCID: PMC4335163. 138. Shultz P, Kamal RN, Daniels AH, DiGiovanni CW, Akelman EA. International health electives during orthopaedic residency training. Journal of Bone & Joint Surgery 2015 Feb 4;97(3):e15. PubMed PMID: 25653331. 139. Truntzer J, Nacca C, Paller DL, Daniels AH. Re-defining the Economics of Geriatric Orthopaedics. Geriatric Orthopaedic Surgery & Rehabilitation2014 Dec;5(4):200-6. doi: 10.1177/2151458514543002. PubMed PMID: 26246943; PubMed Central PMCID: PMC4252154. 140. Daniels AH, Schiebert SS, Palumbo MA. Symptomatic spinal epidural hematoma after lumbar spine surgery: the importance of diagnostic skills. AORN Journal. 2015 Jan;101(1):85-93. doi: 10.1016/j.aorn.2014.03.016. PubMed PMID: 25537329. 141. Grabel Z, DePasse JM, Lareau CR, Born CT, Daniels AH. Intra-articular placement of an intraosseous catheter. Prehospital and Disaster Medicine 2014 Dec 8:1-4. [Epub ahead of print] PubMed PMID: 25483729. 142. Eltorai AEM, Sharma P, Wang J, Daniels AH. Most American Academy of Orthopaedic Surgeons' Online Patient Education Material Exceeds Average Patient Reading Level. Clinical Orthopedics and Related Research 2015 Apr;473(4):1181-6. doi: 10.1007/s11999-014-4071-2. Epub 2014 Dec 5. PubMed PMID: 25475715; PubMed Central PMCID: PMC4353543. 143. Daniels AH, Ames CP, Garfin SR, Shaffrey CI, Riew KD, Smith JS, Anderson PA, Hart RA. Spine surgery training: Is it time to consider categorical spine surgery residency? Spine Journal 2015 Jul 1;15(7):1513-8. doi: 10.1016/j.spinee.2014.08.452. Epub 2014 Nov 6. PubMed PMID: 25442094. 144. Daniels AH, Ames CP, Smith JS, Hart RA. Variability in spine surgery procedures performed during Orthopaedic and Neurological Surgery residency training: an analysis of ACGME case log data. Journal of Bone and Joint Surgery 2014 Dec 3;96(23):e196. PubMed PMID: 25471922. 145. Eltorai AE, Han A, Truntzer J, Daniels AH. Readability of patient education materials on the American Orthopaedic Society for Sports Medicine website. The Physician and Sportsmedicine 2014 Nov;42(4):125-30. doi: 10.3810/psm.2014.11.2099. PubMed PMID: 25419896. 146. Daniels AH, Bariteau JT, Grabel Z, DiGiovanni CW. Prospective Analysis of a Novel Orthopaedic Residency Advocacy Education Program. Rhode Island Medical Journal 2014 Oct 1;97(10):43-6. PubMed PMID: 25271661. 147. Esmende SM, Daniels AH, Paller DJ, Koruprolu S, Palumbo MA, Crisco JJ. Cervical total disc replacement exhibits similar stiffness to intact cervical functional spinal units tested on a dynamic pendulum testing system. Spine Journal. 2015 Jan 1;15(1):162-7. doi: 0.1016/j.spinee.2014.08.442. Epub 2014 Sep 4. PubMed PMID: 25194516. 148. Ritterman SA, Daniels AH, Kane PM, Eberson CP, Born CT. J-Splint use for Temporizing Management of Pediatric Femur Fractures: a review of 18 cases. Pediatric Emergency Care 2014 Aug;30(8):516-20. doi: 10.1097/PEC.0000000000000181. PubMed PMID: 25062297. 149. Eltorai AE, Ghanian S, Adams AA, Born CT, Daniels AH. Readability of Patient Education Materials on the American Association for Surgery of Trauma Website. Archives of Trauma Research 2014 June; 3(1): e18161. DOI: 10.5812/atr.18161. 150. Daniels AH, Daiello LA, Lareau CR, Robidoux KA, Luo W, Ott B, Hayda RA, Born CT. Preoperative Cognitive Impairment and Psychological Distress in Hospitalized Elderly Hip Fracture Patients. American Journal of Orthopedics (Belle Mead NJ). 2014 Jul;43(7):E146-E152. PubMed PMID: 25046191. 151. Pidgeon TS, Borenstein T, Daniels AH, Murali J, Hayda RA.Understanding Multiple Sclerosis: Essentials for the Orthopaedic Surgeon JBJS Reviews, 2014 2014 Jul 15;2(7). pii: 01874474-201402070-00005. doi: 10.2106/JBJS.RVW.M.00120. PubMed PMID: 27490061. 152. Kane P, Vopat B, Paller D, Koruprolu S, Daniels AH, Born C. A Biomechanical Comparison of Locked and Unlocked Long Cephalomedullary Nails in a Stable Intertrochanteric Fracture Model. Journal of Orthopaedic Trauma 2014 Jun 26. [Epub ahead of print] PubMed PMID: 24978941. 153. Daniels AH, Grabel Z, DiGiovanni CW. ACGME Accreditation of Orthopaedic Surgery Subspecialty Fellowship Training Programs. Journal of Bone and Joint Surgery 2014 Jun 4;96(11):e94. PubMed PMID: 24897751. 154. Wang JH, Daniels, AH, Palumbo MP, Eberson CP. Cervical Spine Traction for Management of Spinal Injury and Deformity. JBJS Reviews, 2014 May 27;2(5). pii: 01874474-201402050-00004. doi: 10.2106/JBJS.RVW.M.00108. PubMed PMID: 27500609. 155. Daniels AH, Arthur M, Esmende SM, Vigneswaran H, Palumbo MA. Incidence and Cost of Treating Axis Fractures in the United States from 2000 to 2010. Spine (Phila Pa 1976). 2014 Aug 15;39(18):1498-505. doi: 10.1097/BRS.0000000000000417. PubMed PMID: 24859578. -Featured article: Becker’s Spine Review, August 15th, 2014. 156. Daniels AH, DePasse M, Magill ST, Fischer S, Palumbo MA, Ames C, Hart RA. The Current State of US Spine Surgery Training: a Survey of Residency and Spine Fellowship Program Directors. Spine Deformity. 2014 May 1:2(3):176-185. -Featured article: Becker’s Spine Review, May 14th, 2014. 157. Chodakiewitz Y, Daniels AH, Kamal RN, Weiss APC. Post-traumatic Raynaud’s phenomenon following volar plate injury. Rhode Island Medical Journal. 2014 Apr 1;97(4):24-6. PubMed PMID: 24660212. 158. Kamal RN, Paci G, Daniels AH, Gosselin M, Weiss APC. Quality of Internet Health Information on Thumb Carpometacarpal Joint Arthritis. Rhode Island Medical Journal. 2014 Apr 1;97(4):31-5. PubMed PMID: 24660214. 159. Klinge SA, Vopat BG, Daniels AH, Bariteau JT, Rubin LE, Limbird R. Early Catastrophic Failure of Trochanteric Fixation with the Dall-Miles Cable Grip System. Journal of Arthroplasty. 2014 Jan 10. pii: S0883-5403(14)00004-7. doi: 10.1016/j.arth.2014.01.001. [Epub ahead of print] PubMed PMID: 24529942. 160. Daniels AH, Sobel AD, Eberson CP. Pediatric Thoroacolumbar Spine Trauma. Journal of the American Academy of Orthopaedic Surgeons 2013 Dec;21(12):707-16. doi: 10.5435/JAAOS-21-12-707. PubMed PMID: 24292927. 161. Daniels AH, McDonnell M, Born CT, Hayda RA, Ehrlich MG, Trafton PG, Fischer SA, DiGiovanni CW. Critical analysis of a trauma fellowship-modeled 6-year Orthopaedic Surgery training program. Journal of Bone & Joint Surgery. 2013 Aug 7;95(15):e1081-8. doi: 10.2106/JBJS.L.00988. PubMed PMID: 23925753. 162. Young MD, Daniels AH, Evangelista PT, Rienert SE, Ritterman S, Christino MA, Thakur NA, Born CT. Evaluation of the utility of the Wells score for predicting pulmonary embolus in patients admitted to the orthopaedic trauma service. Orthopedics. 2013 May 1;36(5):e642-7. doi:10.3928/01477447-20130426-29. PubMed PMID: 23672919. 163. Palumbo MA, Bianco AJ, Esmende S, Daniels AH. Wrong-site Spine Surgery. Journal of the American Academy of Orthopaedic Surgeons. 2013 May;21(5):312-20. doi: 10.5435/JAAOS-21-05-312. PubMed PMID: 23637150. 164. Esmende SM, Daniels AH, Palumbo MA. Spinal cord compression after percutaneous kyphoplasty for metastatic compression fracture. The Spine Journal. 2013 Jul;13(7):831-2. doi: 10.1016/j.spinee.2013.02.045. Epub 2013 Mar 21. PubMed PMID: 23523439. 165. Wang JH, Christino MA, Thakur NA, Palumbo MA, Daniels AH. Evaluation of the utility of the Wells score in predicting pulmonary embolism in patients admitted to a spine surgery service. Hospital Practice (Minneap). 2013 Feb;41(1):122-8. doi: 10.3810/hp.2013.02.1018. PubMed PMID: 23466975. 166. Daniels AH, Paller DJ, Koruprolu S, Palumbo MA, Crisco JJ. Dynamic Biomechanical Examination of the Lumbar Spine with Implanted Total Spinal Segment Replacement (TSSR) Utilizing a Pendulum Testing System. PLoS One. 2013;8(2):e57412. doi: 10.1371/journal.pone.0057412. Epub 2013 Feb 25. PubMed PMID: 23451222. 167. Daniels AH. Ghost-face cystic degeneration pattern of the odontoid process. The Spine Journal. 2013 Feb;13(2):202-3. doi: 10.1016/j.spinee.2012.11.025. Epub 2012 Dec 21. PubMed PMID: 23265940. 168. Palumbo MA, Aidlen JP, Daniels AH, Bianco A, Caiati JM. Airway compromise due to laryngopharyngeal edema after anterior cervical spine surgery. Journal of Clinical Anesthesia2012 Dec 19. doi:pii: S0952-8180(12)00375-3. 10.1016/j.jclinane.2012.06.008. [Epub ahead of print] PubMed PMID: 23261648. 169. Feller RJ, Cohen A, Palumbo MA, Daniels AH. Lumbar spinal stenosis: evaluation of information on the Internet. Medicine & Health Rhode Island 2012 Nov;95(11):342-344. PubMed PMID: 23477277. 171. Daniels AH, Weiss AP. Subungual glomus tumor. Medicine & Health Rhode Island 2012 Oct;95(10):334. PubMed PMID: 23155853. 172. Thakur NA, Daniels AH, Schiller J, Valdes MA, Czerwein JK, Schiller A, Esmende S, Terek RM. Benign tumors of the spine. Journal of the American Academy of Orthopaedic Surgeons2012 Nov;20(11):715-24. doi: 10.5435/JAAOS-20-11-715. PubMed PMID: 23118137.
osteochondral fracture following patellar dislocation. Knee Surgery, Sports, Traumatology, Arthroscopy. 2013 Aug;21(8):1856-61. doi: 10.1007/s00167-012-2179-z. Epub 2012 Sep. PubMed PMID: 22983751. 174. Daniels AH, Kane PM, Eberson CP, Born CT. Temporizing Management of Pediatric Femur Fractures Using J-splints. Orthopedics. 2012 Sep 1;35(9):773-6. PubMed PMID: 22955385. 175. Daniels AH, Paller DJ, Koruprolu S, McDonnell M, Palumbo MA, Crisco JJ. Dynamic biomechanical examination of the lumbar spine with implanted total disc replacement using a pendulum testing system. Spine. 2012 Nov 1;37(23):E1438-43. doi: 10.1097 /BRS.0b013e31826b39d7. PubMed PMID: 22869057. 176. Palumbo MA, Aidlen JP, Daniels AH, Thakur NA, Caiati J. Airway compromise due to wound hematoma following anterior cervical spine surgery. The Open Orthopaedics Journal 2012;6:108-13. Epub 2012 Mar 5. PubMed PMID: 22431955; PubMed Central PMCID: PMC3299954. 177. Daniels AH, Magee W, Badra M, Bay B, Hettwer W, Hart RA. Preliminary Biomechanical Proof of Concept for a Hybrid Locking Plate/Variable Pitch Screw Construct for Anterior Fixation of Type II Odontoid Fractures. Spine 2012 Sep 1;37(19):E1159-64. PubMed PMID: 22322377. 178. Hart RA, Daniels AH, Bahney T, Tesar J, Sales JR, Bay B. Relationship of donor variables and graft dimension on biomechanical performance of femoral ring allograft. Journal of Orthopaedic Research 2011 Dec;29(12):1840-5. Doi: 10.1002/jor.21459. Epub 2011 May16. PubMed PMID: 21590719. 179. Daniels AH, Deodhar AA, Hart, RH. Traumatic spondyloptosis resulting from high energy trauma concurrent with a tonic-clonic seizure: case report and literature review. The Spine Journal2009 Jan-Feb;9(1):e1-e4. Epub 2007 Dec 21. PubMed PMID 18082467. 180. Daniels AH, Jurgensmeier D, McKee J, Harrison MW, d'Amato CR. Acute celiac artery compression syndrome following surgical correction of Scheuermann’s kyphosis. Spine 2009 Feb;34(4):E149-52. PubMed PMID: 19214085. 181. Daniels AH, Riew KD, Yoo JU, Birchard K, Kranenburg AJ, Hart RA. Adverse events associated with anterior cervical spine surgery. Journal of the American Academy of Orthopaedic Surgeons 2008 Dec;16(12):729-738. PubMed PMID: 19056921. 182. Daniels AH, Wilson CL, Harrison RH. Hepatitis C associated leukocytoclastic vasculitis with anticardiolipin antibodies causing penile necrosis and deep venous thrombosis in the absence of cryoglobulinemia. Journal of Hospital Medicine2008 Mar;3(2):170-172. PubMed PMID: 18438797. 183. Daniels AH, Arthur M, Hart RA. Variability in rates of arthrodesis procedures for patients with thoracolumbar spine fractures with and without associated neurological injury. Spine 2007 Oct 1;32(21):2334-2338. PubMed PMID: 17906575. 184. Daniels AH, Arthur M, Hart RA. Variability in rates of arthrodesis procedures for patients with cervical spine injuries with and without associated spinal cord injury. Journal of Bone and Joint Surgery American 2007 Feb;89(2):317-323. PubMed PMID: 17272446. 1. Eltorai AE, Daniels AH. National Medical School Matching Program: optimizing outcomes. Adv Med Educ Pract. 2016 Jul 1;7:371-3. doi: 10.2147/AMEP.S108074. eCollection 2016. PubMed PMID: 27445512; PubMed Central PMCID: PMC4936805. 2. Eltorai AE, Simon C, Choi A, Hsia K, Born CT, Daniels AH. Federally mandating motorcycle helmets in the United States. BMC Public Health. 2016 Mar 9;16(1):242. doi: 10.1186/s12889-016-2914-3. PubMed PMID: 26955806; PubMed Central PMCID: PMC4784405. 3. Daniels AH, Walsh K. The orthopedic surgeon: can we turn out the same product in a shorter time frame and with less cost? Orthopedics. 2015 Mar 1;38(3):154-5. doi: 10.3928/01477447-20150305-03. PubMed PMID: 25760495. 4. Daniels AH, DiGiovanni CW. Is Subspecialty Fellowship Training Emerging as a Necessary Component of Contemporary Orthopaedic Surgery Education? Journal of Graduate Medical Education. 2014 Jun;6(2):218-21. doi: 10.4300/JGME-D-14-00120.1. PubMed PMID: 24949124; PubMed Central PMCID: PMC4054719. 5. Eltorai AE, Daniels AH, Grauer JN, Browner BD, Born CT. Costs of non-helmeted motorcycle riding in Connecticut. Connecticut Medicine. 2014 Feb;78(2):91-3. PubMed PMID: 24741858. 6. Eltorai AE, Daniels AH, Hayda RA, Adams CA, Cosgrove GR, Born CT. Motorcycle helmet use in Rhode Island. Rhode Island Medical Journal 2013 Dec 3;96(12):18-20. PubMed PMID: 24303509. 7. Daniels AH. International Rotations during Residency: Spine Deformity Surgery in Ghana. Rhode Island Medical Journal2013 May 1;96(5):15-7. PubMed PMID: 23641456. 1. Eltorai AEM, Daniels AH. “Spinal Disorders in Parkinson’s Disease”. Rhode Island Parkinson’s Disease Association Website, 2015. 2. Daniels AH. “Complications of spinal deformity surgery”. Scoliosis Surgery Resource Center; https://spinescoliosissurgery.com, 2015. 1. Eltorai AEM, Eberson CP, Daniels AH, editors. Orthopedic Surgery Clerkship: A Quick Reference Guide for Senior Medical Students. Springer. ISBN 978-3-319-52565-5; 2016. 2. Hodax J, Eltorai AEM, Daniels AH, editors. The Orthopedic Consult Survival Guide. Springer. ISBN 978-3-319-52346-0; 2017. 3. Eltorai AEM, Eberson CP, Daniels AH, editors. Orthopedic Surgery Rotation: Practical Strategies for Success for Senior Medical Students. Springer. 978-3-319-45664-5; 2017. 4. Eltorai AEM, Gokaslan ZL, Daniels AH, eds. The Bedside Guide to Orthopedic Problems: Lumbar Spine Surgery. Johns Hopkins University Press: Baltimore, MD. 6. Eltorai AEM, Daniels AH, Jenkins DR, Rubin LE, eds. The Bedside Guide to Orthopedic Problems: Hip Replacement. Johns Hopkins University Press: Baltimore, MD. 7. Eltorai AEM, Paxton ES, Daniels AH, eds. The Bedside Guide to Orthopedic Problems: Rotator Cuff Surgery. Johns Hopkins University Press: Baltimore, MD. 8. Eltorai AEM, Got C, Daniels AH, eds. The Bedside Guide to Orthopedic Problems: Hand and Wrist Surgery. Johns Hopkins University Press: Baltimore, MD. 5. Daniels AH, Lincoln E, Eberson CP. Pediatric Spine Trauma, Contemporary Surgical Management of Fractures and Complications Volume 3: Pediatrics, edited by Martin J. Herman and B. David Horn. London: Jaypee Brothers Medical Publishers, 2014. ISBN: 978-9351521204. 6. Daniels AH, Riew KD, Hart RA. Vertebral Artery Injury, The Cervical Spine, 5th edition, edited by Edward C. Benzel. Philadelphia: Lippincott Williams & Wilkins, 2012. ISBN: 978-1605477527. 1. Daniels AH, et al. Cover Art as Featured Article. Orthopedics. 2015 Jul 1;38(7). 2. Daniels AH, et al. Benign Tumors of the Spine—Author Response. Journal of the American Academy of Orthopaedic Surgeon 2013; 20 (11) 715-724. 1. Durand W, Johnson J, Li N, Eltorai AEM, Depasse JM, Daniels AH. Hospital Competitive Intensity Predicts Perioperative Outcomes Following Lumbar Spinal Fusion. Lumbar Spine Research Society, Chicago, IL, April 6th, 2017. 2. Reid D, Daniels AH, Ailon T, Miller E, Smith JS, Shaffrey CI, Lafage V, Schwab FJ, Eltorai AEM, Burton DC, Hart RA, Hostin RA, Bess S, Ames CP. Frailty and Health Related Quality of Life Following Adult Spinal Deformity Surgery. Lumbar Spine Research Society, Chicago, IL, April 6th, 2017. 3. Daniels AH, Ruttiman, R, Eltorai AEM, Depasse JM, Brea B, Palumbo MA. Complications of Spine Surgery: Factors Predictive of Malpractice Litigation. American Academy of Orthopaedic Surgeons, San Diego, CA, March 17th, 2017. 4. Daniels AH, Ailon T, Miller E, Smith JS, Shaffrey CI, Lafage V, Schwab FJ, Eltorai AEM, Burton DC, Hart RA, Hostin RA, Bess S, Ames CP. Despite Higher Risk Stratification Scores, Frail Patients Achieve Greater Two-year Health Related Quality of Life Improvement from Baseline Compared to Non-frail Patients Following Adult Spinal Deformity Surgery. American Academy of Orthopaedic Surgeons, San Diego, CA, March 17th, 2017. 5. Bokshan S, DePasse JM, Eltorai A, Daniels AH. Factors Associated With Outcome Of Litigation Following Total Hip And Knee Arthroplasty. Orthopedic Summit 2016, Las Vegas NV, December 7th, 2016. 6. Ruttiman, R, Eltorai AEM, Daniels AH, Palumbo MA. Complications of Spine Surgery: Factors Predictive of Malpractice Litigation. North American Spine Society (NASS), Boston, MA, October 28th, 2016. 7. Ruttiman, R, Eltorai AEM, Depasse JM, Brea B, Palumbo MA, Daniels AH. Complications of Spine Surgery: Factors Predictive of Malpractice Litigation. 23rd International Meeting on Advanced Spine Techniques (IMAST), Washington, D.C., USA, July 15th, 2016. 8. Eltorai AEM, Daniels AH. Is the readability of spine-related patient education material improving? An assessment of subspecialty websites. Lumbar Spine Research Society, Chicago, IL, April 14th, 2016. 9. Ruttiman, R, Eltorai AEM, Depasse JM, Brea B, Palumbo MA, Daniels AH. Complications of Spine Surgery: Factors Predictive of Malpractice Litigation. Lumbar Spine Research Society, Chicago, IL, April 14th, 2016. 10. Grabel Z, Hart RA, Clark A, Smith JS, Schaffrey CI, Ames, CP, Daniels AH, International Spine Study Group. Adult Spinal Deformity Knowledge in Orthopaedic Spine Surgeons: Impact of Training and Practice Experience. 2016 American Academy of Orthopaedic Surgeons Annual Meeting, Orlando, FL, March 1st-5th, 2016. 11. Daniels AH, Ames CP, JM DePasse, Smith JS, Hart RA. Variability in spine surgery procedures performed during Orthopaedic and Neurological Surgery residency training: an analysis of ACGME case log data. Lumbar Spine Research Society, Chicago, IL, May 1st, 2014. 12. Daniels AH, Esmende S, Arthur M, Vigneswaran H, Palumbo MA. Assessment of the Rapid Increase in Incidence and Cost of Treating C2 Fractures in the United States from 2000-2010. Cervical Spine Research Society, Los Angeles, CA, December 5th, 2013. 13. Feller R, Cohen A, Palumbo MA, Daniels AH. Lumbar spinal stenosis: Evaluation of information on the internet. Mid-America Orthopaedic Association Annual Meeting, Amelia Island, FL, April 19th, 2013. 14. Daniels AH, McDonnell M, Born CT, Hayda RA, Ehrlich MG, Trafton PG, Fischer SA, DiGiovanni CW. Critical analysis of a trauma fellowship-modeled 6-year Orthopaedic Surgery training program. American Academy of Orthopaedic Surgeons. Chicago, IL, March 22nd, 2013. 15. Daniels AH, Paller DJ, Kroluprolu S, McDonnell M, Palumbo MA, Crisco JJ. Dynamic biomechanical examination of the lumbar spine with implanted total disc replacement (TDR) utilizing a pendulum testing system. Lumbar Spine Research Society, Chicago, IL, April 26th, 2012. 16. Daniels AH, Kane PM, Ritterman SA, Eberson CP, Born CT. Utilization of J-splints for temporizing management of pediatric femoral fractures. New England Orthopaedic Society Fall Meeting, Boston, MA, November 20th, 2011. 17. Daniels AH, Arthur M, Hart RA. Regional variability of fusion procedures for patients with cervical spine injuries with and without neurological deficit. Cervical Spine Research Society, San Diego, CA, Dec 1st, 2005. 1. DePasse JM¸Sargent R, Fantry AJ, Bokshan SL, Palumbo MA, Daniels AH. Risk Factors for Malpractice Litigation in Acute Compartment Syndrome. American Academy of Orthopaedic Surgeons, San Diego, CA, March 17th, 2017. 2. Shah KN, Walker G, DePasse JM, Daniels AH. Biomechanical comparison between titanium and cobalt chromium rods used in a pedicle subtraction osteotomy model. American Academy of Orthopaedic Surgeons, San Diego, CA, March 13-17th, 2017. 3. Deckey D, Zega A, Garcia DR, Daniels AH, Jarrell J, Eberson CP, Born CT. Analysis of Growth and Biofilm Formation of Bacterial Pathogens on Frequently-Used Spinal Instrumentation. American Academy of Orthopaedic Surgeons, San Diego, CA, March 14th, 2017. 4. Miller EK, Ailon TT, Scheer JK, Daniels AH, Smith JS, Schwab F, Lafage V, Burton DC, Hart R, Bess S, Shaffrey CI, Ames CP, International Spine Study Group. Despite Higher Risk Stratification Scores, Frail Patients Achieve Greater Two-year Health Related Quality of Life Improvement from Baseline Compared to Non-frail Patients Following Adult Spinal Deformity Surgery. The Annual Meeting of The AANS/CNS Section on Disorders of the Spine and Peripheral Nerves: Spine Summit 2017, Las Vegas, NV, March 8, 2017. 5. Passias PG, Jalai CM, Lafage R, Ramchandran S, Poorman GW, Lafage V, Smith JS, Horn SR, Deviren V, Hart R, Protopsaltis T, Daniels AH, Klineberg E, Shaffrey CI, Ames CP, International Spine Study Grouip. Reciprocal Changes in Unfused Spinal Regions After Treatment of Cervical Deformity Based on Deformity Driver and Surgical Strategies. The Annual Meeting of The AANS/CNS Section on Disorders of the Spine and Peripheral Nerves: Spine Summit 2017, Las Vegas, NV, March 8, 2017. 6. Smith JS, Ailon TT, Shaffrey CI, Kim HJ, Mundis Jr. GM, Gupta MC, Klineberg E, Schwab F, Lafage V, Lafage R, Passias PG, Protopsaltis T, Neuman BJ, Daniels AH, Scheer JK, Soroceanu A, Kebaish K, Hart R, O’Brien MF, Burton DC, Deviren V, Albert T, Riew KD, Bess S, Ames CP, International Spine Study Group. 206 Outcomes of Operative Treatment for Adult Cervical Deformity: A Prospective Multicenter Assessment with One-year Follow-up. The Annual Meeting of The AANS/CNS Section on Disorders of the Spine and Peripheral Nerves: Spine Summit 2017, Las Vegas, NV, March 8, 2017. 7. Smith JS, Shaffrey CI, Kim HJ…10 authors, Daniels AH, …12 authors, ISSG, Outcomes of Operative Treatment for Adult Cervical Deformity: A Prospective Multicenter Assessment with 1-Year Follow-Up. Cervical Spine Research Society, Toronto Canada, December 2nd, 2016. 8. Smith JS, Shaffrey CI, Kim, HJ, 10 authors, Daniels AH, 12 authors, ISSG. Outcomes of Operative Treatment for Adult Cervical Deformity: A Prospective Multicenter Assessment with One-Year Follow-Up. North American Spine Society, Boston, MA, October 27th, 2016. 9. Miller EK, Jain A, Daniels AH, Neuman BJ, Soroceanu A, Ailon T, Sciubba SM, Bess S, Line B, Lafage V, Scheer JK, Kebaish KM, Smith JS, Ames CP, International Spine Study Group. Assessment of a Novel Adult Spinal Deformity (ASD) Frailty Index (ASD-FI) to Assist with Risk Stratification for ASD Surgery. Scoliosis Research Society, Prague, Czech Republic, September 21st-24th, 2016. 10. Ramchandran S, Protopsaltis TS, Sciubba DM, Scheer JK, Daniels AH, Passias PG, Lafage V, Kim HJ, Mundis GM, Klineberg EO, Hart RA, Smith JS, Shaffrey CI, Ames CP, International Spine Study Group. Upper Cervical and Infra-cervical Compensation in Cervical Deformity Patients. 23rd International Meeting on Advanced Spine Techniques (IMAST), Washington, D.C., USA, July 15th, 2016. 11. Bokshan SL, Han AL, DePasee JM, Marcaccio SE, Daniels AH. Impact of Sarcopenia on Post-Operative Morbidity and Mortality following Lumbar Spine Surgery. International Conference on Frailty and Sarcopenia Research, Philadelphia, PA, April 29th, 2016. 12. Miller S, Donegan S, Eltorai AE, Voigt N, Machan J, Daniels AH, Shetty T. Transcranial Motor-Evoked Potentials for Prediction of Postoperative Neurologic Deficit Following Surgery for Thoracolumbar Scoliosis. Lumbar Spine Research Society, Chicago, IL, April 14th, 2016. 13. Rastegar F, Hamilton DK, Hiratzka J, Hiratzka S, Smith J, Bess S, Scheer J, Daniels AH, Lafage V, Hart RA. Perioperative Complications Do Not Affect Patient Satisfaction Following Adult Spinal Deformity Surgery. Lumbar Spine Research Society, Chicago, IL, April 14th, 2016. 14. Bokshan SL, Han AL, DePasee JM, Marcaccio SE, Daniels AH. Impact of Sarcopenia on Post-Operative Morbidity and Mortality following Lumbar Spine Surgery. Lumbar Spine Research Society, Chicago, IL, April 14th, 2016. 15. Rastegar F, Ailon T, Hamilton DK, Hart RA, Klineberg EO, Lafage V, Bess S, Daniels AH, Smith J, Shaffrey CI. Low Fusion Grade Does Not Impact Two-Year Health Related Quality of Life Unless Rod Fracture Occurs for Adult Spinal Deformity Lumbar Spine Research Society, Chicago, IL, April 14th, 2016. 16. DePasse JM, Ahmed AK, Adams CA, Palumbo MA, Daniels AH. Stratified In-Hospital Costs of Elderly Odontoid Fractures by Treatment Modality. 2016 American Academy of Orthopaedic Surgeons Annual Meeting, Orlando, FL, March 1st-5th, 2016. 17. Garcia D, Daniels AH, Zega AM, Deckey DG, Kondo A, Jarrell JD, Eberson CP, Green A, Hayda R, Born CT. Characterization of the Adherence Patterns and Biofilm Density of Commonly Encountered Bacterial Pathogens to Spinal Instrumentation of Differing Compositions. 50th Annual Meeting of the Scoliosis Research Society, Minneapolis, MN, October 2nd, 2015. 18. International Spine Study Group, Scheer JK, Smith JS, Schwab FJ, Lafage V, Schaffrey CI, Bess S, Hart RA, Gupta M, Protopsaltis TS, Hostin R, Deviren V, Line B, Daniels AH, Diebo BG, Lafage R, Zebala LP, Mundis G, Jain A, Ailon T, Kim HJ, Hamilton DK, Burton DC, Klineberg EO, Ames CP. Development of Validated Computer Based Preoperative Predictive Model for Proximal Junction Failure (PJF) or Clinically Significant PJK With 86% Accuracy Based on 510 ASD Patients With Two-Year Follow-Up. Annual Meeting of the North American Spine Society (NASS), Chicago, IL, October 14th-17th, 2015. 19. Neuman BJ, Scheer JK, Ailon T, Klineberg EO, Sciubba DM, Jain A, Kim HJ, Zebala LP, Passias PG, Daniels AH, Burton DC, Protopsaltis PG, Hamilton DK, Ames CP, International Spine Study Group. Development and Validation of a Novel Adult Spinal Deformity Surgical Invasiveness Score: Analysis of 464 Patients. International Meeting on Advanced Spine Techniques, Kuala Lumpur, Malaysia, July 8th-11th, 2015. 20. Koller H, Mayer M, Meier O, Contac AG, Daniels AH, Hamilton KJ, Smith JS, Bess S, Klineberg EO, Ames CP, Schwab FJ, Hart RA, International Spine Study Group. Selecting Caudal Fusion Levels: Two Year Functional Outcomes with Matched Pairs Analysis in Multilevel Fusion to L5 versus S1. International Meeting on Advanced Spine Techniques, Kuala Lumpur, Malaysia, July 8th-11th, 2015. 21. Scheer JK, Smith JS, Schwab FJ, Lafage V, Shaffrey CI, Bess S, Daniels AH, Hart RA, Protopsaltis TS, Mundis GM, Ailon T, Burton DC, Klineberg EO, Ames CP, International Spine Study Group. Development of a Preoperative Predictive Model for Intra- or Peri-Operative Major Complications with High Accuracy Validated with 558 ASD Patients. International Meeting on Advanced Spine Techniques, Kuala Lumpur, Malaysia, July 8th-11th, 2015. 22. Daniels AH, Esmende S, Arthur M, Vigneswaran H, Palumbo MA. Assessment of the Rapid Increase in Incidence and Cost of Treating C2 Fractures in the United States from 2000-2010. North American Spine Society 29th Annual Meeting, San Francisco, CA, November 12th, 2014. 23. Daniels AH, Esmende S, Arthur M, Vigneswaran H, Palumbo MA. Assessment of the Rapid Increase in Incidence and Cost of Treating C2 Fractures in the United States from 2000-2010. American Academy of Orthopaedic Surgeons, New Orleans, LA, March 14th, 2014. 24. Ritterman SA, Daniels AH, Kane PM, Eberson CP, Born CT. Temporizing Management of Pediatric Femur Fractures Utilizing J-Splints. Disaster Response Symposium at the Annual Meeting of the Pediatric Orthopaedic Society of North America (POSNA), Toronto, Ontario, May 2nd, 2013. 25. Wang J, Christino MA, Ritterman SA, Thakur NA, Rienert S, Palumbo MA, Born CT, Evangelista PT, Daniels AH. Evaluation of the utility of the Wells Score for predicting pulmonary embolus in patients admitted to the spine surgery service. Mid-America Orthopaedic Association Annual Meeting, Amelia Island, FL, April 19th, 2013. 26. Kamal RN, Paci G, Daniels AH, Gosselin M, Weiss APC. Quality of Internet Health Information on Thumb Carpometacarpal Joint Arthritis. American Academy of Orthopaedic Surgeons. Chicago, IL, March 22nd, 2013. 27. Lee BJ, Christino MA, Daniels AH, Eberson CP. Pediatric osteochondral fractures of the patella. Eastern Orthopaedic Association 42nd Annual Meeting, Williamsburg, VA, October 20th, 2011. 28. Daniels AH, Arthur M, Hart RA. Variability in rates of fusion procedures for patients with thoracolumbar spine fractures with and without associated spinal cord injury. The International Society for the Study of the Lumbar Spine, Bergen, Norway, June 13-17, 2006. 1. Goodman AD, Johnson JP, Kleiner J, Gil JA, Daniels AH. The Expanding Use of Arthroplasty for Distal Humerus Fractures: Management of 106,237 Patients from 2002-2012. iPoster presentation at: American Society for Surgery of the Hand (ASSH), San Francisco, CA, 2017. 2. Goodman AD, Johnson JP, Daniels AH, Kleiner J, Gil JA, Hayda RA. Fixation, Arthroplasty, and Conservative Management of Proximal Humerus Fractures: An Analysis of 468,922 Patients from 2002-2012. iPoster presentation at: American Society for Surgery of the Hand (ASSH) , San Francisco, CA, 2017. 3. Daniels AH, Eltorai AEM, Baird GL, Yanney K, Marsh JL, Hart R. AOA Critical Issues: The Importance of Mentorship during Orthopaedic Surgery Residency. The American Orthopaedic Association 2017 Meeting, Charlotte, NC, June 20-24, 2017. 4. Bokshan SL, Han A, DePasse JM, Eltorai AEM, Marcaccio S, Palumbo MA, Daniels AH. Impact of Sarcopenia on Post-Operative Morbidity and Mortality Following Thoracolumbar Spine Surgery. The American Orthopaedic Association 2017 Meeting, Charlotte, NC, June 20-24, 2017. 5. Bokshan SL, Marcaccio S, DePasse JM, Iyengar R, Eltorai AEM, Daniels AH. Inpatient Costs and Blood Transfusion Rates of Sarcopenic Patients Following Thoracolumbar Spine Surgery. The American Orthopaedic Association 2017 Meeting, Charlotte, NC, June 20-24, 2017. 6. Bokshan SL, Ruttiman R, Eltorai AEM, DePasse JM, Antoci V, Daniels AH. Factors Associated with Outcome of Litigation Following Total Hip and Knee Arthroplasty. The American Orthopaedic Association 2017 Meeting, Charlotte, NC, June 20-24, 2017. 7. Ruttiman R, Eltorai AEM, DePasse JM, Brea Bielinsky, Daniels AH, Palumbo MA. Malpractice Litigation Following Spine Surgery. The American Orthopaedic Association 2017 Meeting, Charlotte, NC, June 20-24, 2017. 8. DePasse JM, Haglin J, Eltorai AEM, Mulcahey M, Eberson C, Daniels AH. Orthopedic In-Training Examination Question Metrics and Resident Test Performance. The American Orthopaedic Association 2017 Meeting, Charlotte, NC, June 20-24, 2017. 9. Bokshan SL, Ruttiman R, Eltorai AEM, DePasse JM, Daniels AH, Owens BD. Factors Associated with Physician Loss in ACL Reconstruction Malpractice Lawsuits. The American Orthopaedic Association 2017 Meeting, Charlotte, NC, June 20-24, 2017. 10. DePasse JM, Ruttiman R, Eltorai AEM, Palumbo MA, Daniels AH. Assessment of Malpractice Claims due to Spinal Epidural Abscess. The American Orthopaedic Association 2017 Meeting, Charlotte, NC, June 20-24, 2017. 11. Kleiner J, Eltorai AEM, Daniels AH. Matched Cohort Analysis of Elective Lumbar Spinal Fusion in Patients with and without Parkinson's Disease: Complications, Length of Stay, and Hospital Charges. The American Orthopaedic Association 2017 Meeting, Charlotte, NC, June 20-24, 2017. 12. Kleiner J, Eltorai AEM, Rubin LE, Daniels AH. Matched Cohort Analysis of Total Knee Arthroplasty in Patients with and without Parkinson's Disease: Complications, Mortality, Length of Stay, and Hospital Charges. The American Orthopaedic Association 2017 Meeting, Charlotte, NC, June 20-24, 2017. 13. DePasse JM, Nzeogu MI, Travers C, Mulcahey MK, Palumbo MA, Marsh JL, Hart R, Daniels AH. Early Subspecialization in Orthopaedic Surgery Training. The American Orthopaedic Association 2017 Meeting, Charlotte, NC, June 20-24, 2017. 14. Durand W, Johnson J, Li N, Eltorai AEM, Depasse JM, Daniels AH. Hospital Teaching Status and Ownership Affect Perioperative Outcomes Following Lumbar Spinal Fusion. Lumbar Spine Research Society, Chicago, IL, April 6th, 2017. 15. Bokshan SL, Ruttiman R, Eltorai AEM, DePasse JM, Daniels AH, Owens BD. Epidemiology and Factors Associated with Physician Loss in Anterior Cruciate Ligament Reconstruction Malpractice Lawsuits. American Academy of Orthopaedic Surgeons, San Diego, CA, March 17th, 2017. 16. Bokshan SL, Ruttiman R, Eltorai AEM, DePasse JM, Palumbo MA, Daniels AH. Factors Associated with Outcome of Litigation Following Total Hip and Knee Arthroplasty. American Academy of Orthopaedic Surgeons, San Diego, CA, March 17th, 2017. 17. Ruttiman, R, Eltorai AEM, DePasse JM, Palumbo MA, Daniels AH. Cervical Spine Malpractice Litigation. Cervical Spine Research Society, Toronto Canada, December 2nd, 2016. 18. Miller S, Donegan S, Voigt N, Eltorai A, Daniels AH, Shetty T. Transcranial Motor-Evoked Potentials for Prediction of Postoperative Neurologic Deficit Following Surgery for Thoracolumbar Scoliosis. North American Spine Society, Boston MA, October 26th-28th, 2016. 19. Miller EK, Jain A, Daniels AH, Neuman BJ, Soroceanu A, Ailon T, Sciubba SM, Bess S, Line B, Lafage V, Scheer JK, Kebaish KM, Smith JS, Ames CP, International Spine Study Group. Assessment of a Novel Adult Spinal Deformity (ASD) Frailty Index (ASD-FI) to Assist with Risk Stratification for ASD Surgery. North American Spine Society, Boston MA, October 26th-28th, 2016. 20. Miller E, Neuman BJ, Sciubba DM, 3 authors, Daniels AH, 7 authors, ISSG. Comparison of Frailty Based on Cervical and Global SVA Classification. North American Spine Society, Boston MA, October 26th-28th, 2016. 21. Smith JS, Shaffrey CI, Kim HJ, 10 authors, Daniels AH, 12 authors, ISSG. Outcomes of Operative Treatment for Adult Cervical Deformity: A Prospective Multicenter Assessment with One-Year Follow-Up. North American Spine Society, Boston MA, October 26th-28th, 2016. 22. Smith JS, Line B, Bess S, Shaffrey CI, Kim HJ, Mundis G, Scheer JK, Klineberg E, O'Brien M, Hostin R, Gupta M, Daniels AH, Kelly M, Gum JL, Schwab FJ, Lafage V, Lafage R, Ailon T, Passias P, Protopsaltis T, Albert TJ, Riew KD, Hart R, Burton D, Deviren V, Ames CP, ISSG. The health impact of adult cervical deformity in patients presenting for surgical treatment: comparison to United States population norms and chronic disease states based on the EQ-5D. North American Spine Society, Boston MA, October 26th-28th, 2016. 23. Daniels AH, Line B, Lafage V, 10 authors, ISSG. When Do Surgeons Choose Upper Thoracic versus Lower Thoracic Proximal End Point for Fusion of Adult Spinal Deformity Patients? North American Spine Society, Boston MA, October 26th-28th, 2016. 24. Hamilton DK, Buza J, Passias P, 7 authors, Daniels AH, 6 authors, ISSG. The Fate of Adult Spinal Deformity (ASD) Patients Incurring Rod Fracture after Thoracolumbar Fusion without Prior Three-Column Osteotomy. North American Spine Society, Boston MA, October 26th-28th, 2016. 25. Ramchandran S, Protopsaltis TS, Sciubba DM, Scheer JK, Daniels AH, Passias PG, Lafage V, Kim HJ, Mundis GM, Klineberg EO, Hart RA, Smith JS, Shaffrey CI, Ames CP, International Spine Study Group. International Spine Study Group. Upper Cervical and Infra-cervical Compensation in Cervical Deformity Patients. Scoliosis Research Society, Prague, Czech Republic, September 21st-24th, 2016. 26. Gil J, Owens, B, Daniels AH. Variability of Arthroscopy Case Volume in Orthopaedic Surgery Residency. Council of Orthopaedic Residency Directors Conference (CORD), AOA/COA Combined Meeting, Seattle, WA, June 24th-25th, 2016. 27. DePasse JM, Palumbo MA, Hart RA, Daniels AH. Early Subspecialization in Orthopedic Spine Surgery Training. Council of Orthopaedic Residency Directors Conference (CORD), AOA/COA Combined Meeting, Seattle, WA, June 24th-25th, 2016. 28. Sargent R, DePasse JM, Palumbo MA, Daniels AH. Predictive Factors in Compartment Syndrome Malpractice Litigation. 2016 AOA Annual Meeting, Seattle, WA, June 22nd-25th, 2016. 29. DePasse JM, Palumbo MA, Hart RA, Daniels AH. Early Subspecialization in Orthopedic Spine Surgery Training. Lumbar Spine Research Society, Chicago, IL, April 14th, 2016. 30. Rastegar F, Contag A, Daniels AH, Hiratzka J, Lin C, Than K, Raslan A, Kong C, Nguyen N, Hart RA. Proximal Junctional Kyphosis: Inter- and Intra-observer reliability in Adult Spinal Deformity. Lumbar Spine Research Society, Chicago, IL, April 14th, 2016. 31. Rastegar F, Contag A, Daniels AH, Hiratzka J, Lin C, Chang J, Than K, Raslan A, Kong C, Nguyen N, Hostin R, Robert Hart. Proximal Junctional Failure Severity Scale (PJFSS); inter- and intra-observer reliability. Lumbar Spine Research Society, Chicago, IL, April 14th, 2016. 32. Garcia D, Daniels AH, Zega AM, Deckey DG, Kondo A, Jarrell JD, Eberson CP, Green A, Hayda R, Born CT. Characterization of the Adherence Patterns and Biofilm Density of Commonly Encountered Bacterial Pathogens to Spinal Instrumentation of Differing Compositions. Orthopaedic Research Society 2016 Annual Meeting, Orlando, FL, March 5th-8th, 2016. 33. Gil J, Eltorai AEM, Weiss APC, Daniels AH. Variability in Surgical Case Volume of Orthopaedic Surgery Residents from 2007-2013. ACGME Annual Educational Conference, National Harbor, MD, February 24th-28th, 2016. 34. Gil J, Daniels AH, Akelman EA. Resident Exposure to Peripheral Nerve Surgical Procedures During Residency Training, American Association for Hand Surgery Annual Meeting, Scottsdale, AZ, January 13th-16th, 2016. 35. DePasse JM, Palumbo MA, Eberson CP, Daniels AH. Academic Characteristics of Orthopaedic Surgery Residency Applicants from 2007 to 2014. 2016 American Academy of Orthopaedic Surgeons Annual Meeting, Orlando, FL, March 1st-5th, 2016. 36. Gil JA, Park S, Daniels AH. Variability in United States Allopathic Medical School Tuition. 23rd Hospitals Research Symposium, Providence, RI, October 29th, 2015. 37. Gil JA, Waryasz GR, Liu D, Daniels AH. Influence of Medical Student Debt on Career Choice. 23rd Hospitals Research Symposium, Providence, RI October 29th, 2015. 38. Eltorai AEM, Naqvi SS, Ghanian S, Eberson CP, Weiss APC, Born CT, Daniels AH. Readability of Invasive Procedure Consent Forms. 23rd Hospitals Research Symposium, Providence, RI October 29th, 2015. 39. Merritt AC, Vigneswaran H, Miller S, DePasse JM, Shah K, Eberson CP, Palumbo MA, Daniels AH. Obese Adult Spinal Deformity Patients with Complications have Lower Hospital Charges and Length of Stay then Non-obese Patients. 23rd Hospitals Research Symposium, Providence, RI October 29th, 2015. 40. Eltorai ADM, Sinha I, Kalagara S, Daniels AH. Readability of patient education materials on the British Society for Surgery of the Hand website. British Society for Surgery of the Hand Autumn Meeting, London England, October 15th-16th, 2015. 41. Grabel Z, Vigneswaran H, Eberson CP, Palumbo MA, Daniels AH. Postoperative Transfusion Rates, Complications, and Hospital Charges Following Surgical Treatment of Adolescent Idiopathic Scoliosis in the United States from 1997 to 2012. 30th Annual North American Spine Society (NASS) meeting, Chicago, IL, October 14-18th, 2015. 42. International Spine Study Group, Smith JS, Lafage V, Shaffrey CI, 10 others, Daniels AH, 6 others, Ames CP. Prospective Multicenter Assessment of Early Complication Rates Associated with Adult Cervical Deformity Surgery in 78 Patients. 30th Annual North American Spine Society (NASS) meeting, Chicago, IL, October 14-18th, 2015. 43. Klineberg E, Iyer S, Zebala LP, Kelly MP, Hart, RA, Gupta M, Hamilton DK, Mundis GM, Sciubba D, Ames CP, Daniels AH, Smith J, Lafage V, Burton D, Kim HJ. Dural Tears do not Affect Outcomes or Rates of Other Associated Complications in Adult Spinal Deformity Surgery. 30th Annual North American Spine Society (NASS) meeting, Chicago, IL, October 14-18th, 2015. 44. Daniels AH, Shah K, Vigneswaran H, Eberson CP, Palumbo MA. Complication Rates and Cost of Pediatric Spinal Deformity Surgery in the United States from 1997 to 2012. 128th Annual Meeting of the American Orthopaedic Association, Providence, RI, June 24th-27th, 2015. 45. Eltorai AE, Daniels AH. Readability of American Academy of Orthopaedic Surgeons’ online patient education materials. 128th Annual Meeting of the American Orthopaedic Association, Providence, RI, June 24th-27th, 2015. 46. Deckey DG, Zega A, Fox HM, Konda A, Garcia D, Daniels AH, Eberson C, Jarrell JD, Born CB. A Silver-Doped TiO2-PDMS Hybrid Coating to Deter Infection in Orthopaedic Surgery. Brown Public Health Research Day. Providence, RI, April 16th, 2015. 47. Miller S, Vigneswaran H, Merritt A, Eberson CP, Palumbo MA, Daniels AH. Nonwhite Patients Incur Greater Hospital Charges and Have Greater Length of Stay Compared to White Patients Following Surgical Treatment of Adult Spinal Deformity. RI ACP 2015 Resident/Fellow Forum Competition. Pawtuxet, RI, May 7th, 2015. 48. Daniels AH, Vigneswaran H, Eberson CP, Palumbo MA. Pediatric Spinal Deformity Surgery in the United States: Surgical Approach, Complications, and Hospital Charges From 1997 To 2012. Annual Meeting of the Pediatric Orthopaedic Society of North America, Atlanta, GA, April 29th-May 2nd, 2015. 49. Hart RA, DePasse JM, Daniels AH. Failure to Launch: What the Rejection of Lumbar Total Disc Replacement Tells Us About American Spine Surgery. Lumbar Spine Research Society, Chicago, IL, April 9th-10th, 2015. 50. Daniels AH, Vigneswaran H, Eberson CP, Palumbo MA. Surgical treatment of Pediatric Spinal Deformity in the United States from 1997 to 2009: An Analysis of 22,823 Patients. American Academy of Orthopaedic Surgeons Annual Meeting, Las Vegas, NV, March 24th-27th, 2015. 51. Daniels AH, Ames CP, Grabel Z, Smith JS, Hart RA. Variability in spine surgery procedures performed during Orthopaedic and Neurological Surgery residency training: an analysis of ACGME case log data. AANS/CNS Joint Section on Disorders of the Spine and Peripheral Nerves, Phoenix, AZ, March 4-7th, 2015. 52. Daniels AH, Grabel Z, Vigneswaran H, Eberson CP, Palumbo MA. Surgical treatment of Pediatric Spinal Deformity in the United States from 1997 to 2009: An Analysis of 22,823 Patients. AANS/CNS Joint Section on Disorders of the Spine and Peripheral Nerves, Phoenix, AZ, March 4-7th, 2015. 53. Daniels AH, Ames CP, Smith JS, Hart RA. Variability in spine surgery procedures performed during Orthopaedic and Neurological Surgery residency training: an analysis of ACGME case log data. North American Spine Society 29th Annual Meeting, San Francisco, CA, November 12th-15th, 2014. Current Practice Trends and Common Injuries. Lifespan Annual Research Celebration, Providence, RI, October 2nd, 2014. 55. Deckey DG, Fox HM, Kondo A, Hayda AV, Garcia DR, Daniels, AH, Jarrell JD, and Born CT. Characterization of Biofilm Formation on Spinal Implants of Varying Compositions. Lifespan Annual Research Celebration, Providence, RI, October 2nd, 2014. 56. Fox HM, Deckey DG, Kondo A, Hayda AV, Garcia DR, Daniels AH, Jarrell JD, and Born CT. Visualization and Characterization of Bacterial Biofilm on Orthopaedic Trauma Explants. Lifespan Annual Research Celebration, Providence, RI, October 2nd, 2014. 57. Fox HM, Deckey DG, Kondo A, Hayda AV, Garcia DR, Daniels AH, Jarrell JD, Born CT. Visualization and Characterization of Bacterial Biofilm on Orthopaedic Trauma Explants. Brown Summer Research Symposium, Providence, RI, September 7th, 2014. 58. Deckey DG, Fox HM, Kondo A, Hayda AV, Garcia DR, Daniels AH, Born CT. The Characterization of Biofilm Formation on Spinal Implants of Varying Compositions. Brown Summer Research Symposium, Providence, RI, September 7th, 2014. 59. Daniels AH, DePasse M, Magill ST, Fischer S, Palumbo MA, Ames C, Hart RA. The Current State of US Spine Surgery Training: a Survey of Residency and Spine Fellowship Program Directors. Council of Orthopaedic Residency Directors Conference (CORD), AOA/COA Combined Meeting, Montreal, Quebec, June 20th-21st, 2014. 60. Bariteau JT, Grabel Z, Daniels AH, Gotha H, DiGiovanni CW. Prospective Analysis of a Novel Orthopaedic Residency Advocacy Education Program. Council of Orthopaedic Residency Directors Conference (CORD), AOA/COA Combined Meeting, Montreal, Quebec, June 20th-21st, 2014. 61. Esmende SM, Daniels AH, Paller DP, Kroluprolu S, Palumbo MA, Crisco JJ. Biomechanical analysis of volumetric bone mineral density and anterior screw fixation in an odontoid fracture model. 60th Annual Meeting of the Orthopaedic Research Society, New Orleans, LA, March 15th-18th, 2014. 62. Bariteau JT, Grabel Z, Daniels AH, DiGiovanni CW. Prospective Analysis of a Novel Orthopaedic Residency Advocacy Education Program. American Academy of Orthopaedic Surgeons Annual Meeting, New Orleans, LA, March 11th-15th, 2014. 63. Daniels AH, DePasse M, Magill ST, Fischer S, Palumbo MA, Ames C, Hart RA. The Current State of US Spine Surgery Training: a Survey of Residency and Spine Fellowship Program Directors. 41st Annual Cervical Spine Research Society Meeting, Los Angeles, CA, December 5th-7th, 2013. 64. Esmende SM, Daniels AH, Paller DP, Kroluprolu S, Palumbo MA, Crisco JJ. Biomechanical Analysis of Volumetric Bone Mineral Density and Anterior Screw Fixation in a Type II Odontoid Fracture Model. 41st Annual Cervical Spine Research Society Meeting, December 5th-7th, 2013. 65. Daniels AH, Daiello LA, Badger J, Born CT, Hayda R, Ott BR, Szaro J, Cooper MR. Preoperative cognitive impairment, pain, and psychological stress in hospitalized elderly patients awaiting surgery for hip fracture. 29th Annual Meeting of the Orthopaedic Trauma Association (OTA), Phoenix, AZ, October 9 – 12th, 2013. 66. McDonnell M, Paller DL, Daniels AH, Koruprolu S, Thakur NA, Palumbo MA. Biomechanical Analysis of Pedicle Screw Fixation Constructs for Stabilization of Thoracolumbar Burst Fractures. 28th Annual North American Spine Society (NASS) meeting, New Orleans, LA, October 9-12th, 2013. 67. Daniels AH, DePasse JM, Magill ST, Fischer S, Ames CP, Hart RA. Optimization of spine deformity surgery training: a national survey of residency and spine fellowship program directors. 48th Scoliosis Research Society (SRS) Annual Meeting & Course, Lyon, France, September 18-21, 2013. 68. Daiello L, Daniels AH, Lareau C, Robidoux K, Luo W, CAFE Study Group. Association of unrecognized preoperative cognitive impairment with postoperative cognitive and functional outcomes in elderly people awaiting hip fracture repair. Alzheimer's Association International Conference 2013, Boston, Massachusetts, July 13-18th, 2013. 69. Daniels AH, DePasse JM, Magill ST, Fischer S, Ames CP, Hart RA. Optimization of spine deformity surgery training: a national survey of residency and spine fellowship program directors. 20th International Meeting on Advanced Spine Techniques (IMAST), Vancouver, British Columbia, Canada, July 10-13th, 2013. 70. Young M, Christino MA, Ritterman SA, Thakur NA, Rienert S, Palumbo MA, Born CT, Evangelista PT, Daniels AH. Evaluation of the utility of the Wells Score for predicting pulmonary embolus in patients admitted to the orthopaedic trauma service. Mid-America Orthopaedic Association Annual Meeting, Amelia Island, FL, April 19th, 2013. 71. Daniels AH, Paller DJ, Kroluprolu S, McDonnell M, Palumbo MA, Crisco JJ. Damping of Oscillating Rotational Motion of the Lumbar Spine with and without Implanted Total Spinal Segment Replacement. International Society for Advancement of Spine Surgery (ISASS13), Vancouver, BC, Canada, April 3-5, 2013. 72. Wang J, Christino MA, Ritterman SA, Thakur NA, Rienert S, Palumbo MA, Born CT, Evangelista PT, Daniels AH. Evaluation of the utility of the Wells Score for predicting pulmonary embolus in patients admitted to the spine surgery service. International Society for Advancement of Spine Surgery (ISASS13), Vancouver, BC, Canada, April 3-5, 2013. 73. Esmende S, Daniels AH, Koruprolu S, Paller D, Palumbo MA, Crisco JJ. Dynamic Biomechanical Examination of the Cervical Spine Using a Novel Pendulum System. International Society for Advancement of Spine Surgery (ISASS13), Vancouver, BC, Canada, April 3-5, 2013. 74. Wang J, Christino MA, Palumbo MA, Ritterman SA, Rienert S, Born CT, Daniels AH. Evaluation of the utility of the Wells Score for predicting pulmonary embolus in patients admitted to the spine surgery service. AANS/CNS Joint Section on Disorders of the Spine and Peripheral Nerves, Phoenix, AZ, March 6-9th, 2013. 75. Daniels AH, Feller RJ, Cohen A, Palumbo MA. Lumbar spinal stenosis: evaluation of information on the Internet. AANS/CNS Joint Section on Disorders of the Spine and Peripheral Nerves, Phoenix, AZ, March 6-9th, 2013. 76. Daniels AH, Daiello LA, Badger J, Born CT, Hayda R, Ott BR, Szaro J, Cooper MR. Cognitive assessment following hip fracture in the elderly (CAFÉ study). Rhode Island Hospital 20th Annual Research Celebration, Providence, RI, October 11th, 2012. 77. Daniels AH, Koruprolu S, Paller DJ, Crisco JJ. Dynamic biomechanical examination of the lumbar spine with implanted total spinal segment replacement (TSSR) utilizing a pendulum system. Rhode Island Hospital 20th Annual Research Celebration, Providence, RI, October 11th, 2012. 78. Wang J, Christino MA, Ritterman SA, Thakur NA, Rienert S, Palumbo MA, Born CT, Evangelista PT, Daniels AH. Evaluation of the utility of the Wells Score for predicting pulmonary embolus in patients admitted to the spine surgery service. Rhode Island Hospital 20th Annual Research Celebration, Providence, RI, October 11th, 2012. 79. Lee BJ, Christino MA, Daniels AH, Hulstyn MJ, Eberson CP. Pediatric patellar osteochondral fracture following patellar dislocation. Arthroscopy Association of North America 2012 Annual Meeting, Orlando, FL, May 17-19, 2012. 80. Hart RA, Daniels AH, Mummaneni PV, Hostin RA, Shaffre CI, Smith JS, Line B, Lafage V, Bess S. “Evaluation of self reported functional limitations due to lumbar stiffness in adult spinal deformity patients.” Lumbar Spine Research Society, Chicago, IL, April 26-27th, 2012. 81. Hart RA, Daniels AH, Mummaneni PV, Line B, Lafage V, Akbarnia BA, Mundis GM, Bess S. Functional limitations due to lumbar stiffness correlate with age and SRS-22 scores in asymptomatic volunteers. Lumbar Spine Research Society, Chicago, IL, April 26-27th, 2012. 82. Daniels AH, Koruprolu S, Paller DJ, Crisco JJ. Dynamic biomechanical examination of the lumbar spine with implanted total spinal segment replacement (TSSR) utilizing a pendulum system. Orthopaedic Research Society 2012 Annual Meeting, San Francisco, CA, February 3-7, 2012. 83. Hart RA, Daniels AH, Bahney T, Sales JR, Bay B. Relationship of donor variables and graft dimension on biomechanical performance of femoral ring allograft. Rhode Island Hospital 18th Annual Research Celebration, Providence, RI, October 21st, 2010. 84. Hart RA, Daniels AH, Bahney T, Cabalo AE, Lanning K. Relationship of donor variables and graft dimension on biomechanical performance of femoral ring allograft. American Association of Tissue Banks 34th Annual Meeting, National Harbor MD, Sept 11-13th, 2010. 85. Larson DL, Daniels AH, Byrd GD, Hart RA. Effects of recombinant human bone morphogenic protein-2 (rhBMP-2) on the rat lung. American Academy of Orthopaedic Surgeons, New Orleans, LA, March 10-13th 2010. 86. Wilson CL, Daniels AH, Harrison RH. Hepatitis C associated leukocytoclastic vasculitis with anticardiolipin antibodies causing penile necrosis and deep venous thrombosis in the absence of cryoglobulinemia: a case report. Annual Society of General Internal Medicine Meeting, Toronto, ON, April 26th 2007. 87. Wilson CL, Daniels AH, Harrison RH. Hepatitis C associated leukocytoclastic vasculitis with anticardiolipin antibodies causing penile necrosis and deep venous thrombosis in the absence of cryoglobulinemia: a case report. Northwest Regional Society of General Internal Medicine Meeting, Portland, OR, March 2nd 2007. "Dr Daniels is the best doctor I have ever seen no matter what other specialty doctors I've had to see for other conditions, he is the most respectful and compassionate Dr I have ever had. Also his physician's assistant Kaylee Lyford is just as compassionate and understanding as he is. Dr Daniels operated on my back in January of 2016 and have never had an issue with that Fusion.I am scheduled for another back surgery on January 31st and he spent a lot of time with me at my appointment yesterday explaining what options I had and we decided what was the best option for me to take." "Excellent care and patient concern. Efficient care and resolution to the issue and awesome follow up and friendly caring staff." "Dr. Daniels is always informative, knowledgeable and extremely caring. Thank you Dr. Daniels for taking such good care of me during the surgery process." "I'm very happy with Dr Daniels and would definitely recommend my friends and family to him. He has a good bedside manner." "My entire experience with Dr. Daniels and his entire staff has been incredible from the first day I met them. I cannot say enough positive things about him and his staff. I would recommend him to anyone who is in need of a spine surgeon! He's the best!" "I am so happy that I was referred to him and I will highly referred to him to anybody I know! He's an awesome surgeon!" "Dr Daniels is very professional very easy to understand and very personable he is an excellent surgeon as well can't beat it, I have already recommend him to s few people. One of the people already See's another Dr in that office." "Dr. Daniels is by far the best doctor I have seen overall. He performed at diseconomy on my lumbar spine (removed a herniated disk from the lower back) and I was back to my daily routine just a few days later. Following my surgery, he was even willing to answer my call at 9:30pm on a Sunday night to answer my many questions regarding post-op. He also makes an effort to get to know each of his patients and was the first visitor I had the morning following my surgery, just to check in on me." "Brandy Isomin Rhode Island I had surgery March 6, 2017 and I feel wonderful. Dr. Daniels performed an anterior and posterior lumber fusion and I no longer have serve pain in my right leg. Everyone at University of Orthopedics has been wonderful. My experience has been great. I truly appreciated it. I am so gladful I did this and now I can get back to the old me. I am glad to meet one of the best doctor's. Thanks." "Dr. Daniels was excellent on all fronts. He understood my pain and diagnosed the problem quickly, knew exactly how to fix it, and took the time to explain the surgery that was required - a cervical discectomy and fusion of multiple discs. Dr. Daniels was empathetic, has a wonderful personality, and genuinely expresses care and concern every time you see him. The best part... he performed the surgery perfectly. 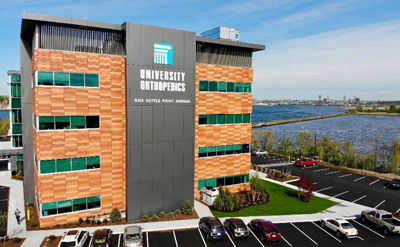 My family and I will be forever grateful to Dr. Daniels and University Orthopedic." "I had the grate fortune to be referred to Dr. Daniels by my Family Doctor when I was in need of spinal surgery for stenos in my lower back. Dr. Daniels was no only well knowledge in this type of surgery, his expertise and caring manner made for a very successful surgery and a fast recovery…I would recommend him without any hesitation." "Dr Daniels, is excellent and very kind. My experience was wonderful. Thank you Dr Daniels!" "I highly recommend Dr. Daniels. He was able to diagnose me for Spinal stenosis Myelopathy clearly and quickly based on my MRI and symptoms. His staff Sarah and Lisa are exceptionally competent and compassionate. They scheduled the necessary tests in a timely manner and were able to schedule surgery quickly. Dr. Daniels explained the surgical procedure in detail and made both my family and me extremely comfortable. Dr. Daniels returned my quality of my life back." "Dr. Alan Daniels is without question the most caring and capable physician I have ever known. During the almost two years I was under his expert care, Dr. Daniels and his staff made me feel more like a family friend rather than just another patient. After two complex spine surgeries, my recovery is going very well with no complications! It has been quite the journey for me and my family, however Dr. Daniels and his outstanding staff have expertly cared for me every step of the way! Thanks!" "I am 58 and 18 days into my recovery from a diskectomy procedure.It is evident that the procedure was a total success. My family and friends are impressed with the progress of my recovery.My life is already 90 percent back to normal with the only exception for heavy lifting.That is because my work is physically demanding and I respect every ones investment to get my health back.A 10 rating to Dr.Daniels,Lisa,Sarah and staff for treated me like their only patient.This group has a bright future." "At our first appointment, Dr. Daniels gave me something that my previous orthopedic did not -- his time. After living with severe back pain for weeks and not having success with less invasive measures, I agreed that spine surgery was the necessary next step. Though I wasn't crazy about the idea, Dr. Daniels answered all of my questions and assured me that I would feel better and be able to resume a normal life after surgery. Thanks to Dr. Daniels, I am now on the road to recovery." 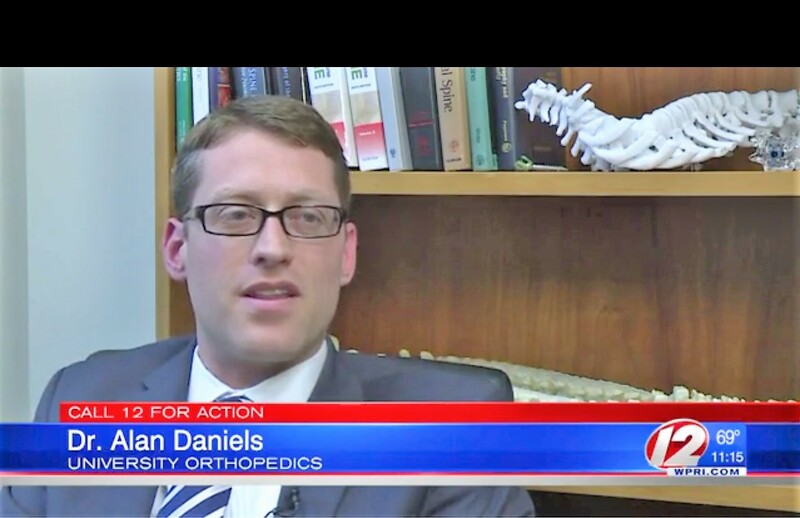 University Orthopedics Spine Surgeon Dr. Alan Daniels was interviewed by WPRI/ CBS Channel 12 reporter Susan Campbell about "text neck" and what smart phone users can do to avoid this condition. Click here to read the article. Sometimes surgery at University Orthopedics can be life changing. That was the case with recent patient Grace. After several failed surgeries she suffered from severe spinal deformity and lived a difficult and painful life with a hunchback posture. Grace turned to adult spine specialist Dr. Alan Daniels. This is Grace's story. Nelson is a young, active adult who experienced debilitating pain in his back from a bulging disc. Dr. Alan Daniels performed surgery to correct the problem. This is Nelson in his own words on his experience with Dr. Daniels and the University Orthopedics staff. Dr. Alan Daniels is a spine surgeon at University Orthopedics. Dr. Daniels specializes in complex spine problems including scoliosis and adult spinal deformity. Spine surgeon Dr. Alan Daniels discusses the benefits of EOS Imaging. In an effort to continue our commitment to providing the highest quality care, University Orthopedics now offers EOS®, a low dose, 2D/3D imaging system dedicated to adult and pediatric patients with musculoskeletal pathologies. Firefighting, life guarding and playing hockey are a few activities that define Joe's active lifestyle. When severe back pain prevented Joe from doing the things he loved he turned to the Center for Spine Health at University Orthopedics and adult spine surgeon Dr. Alan Daniels to get his life back. This is Joe's story.